A fresh snow fall, the thickest of the entire year… and coincidentally the only day that I set my alarm incorrectly! So this morning’s post is a bit of a hybrid between the actual Sunrise 150 and a couple of pictures that I took yesterday morning at Ault Park on my way to work. 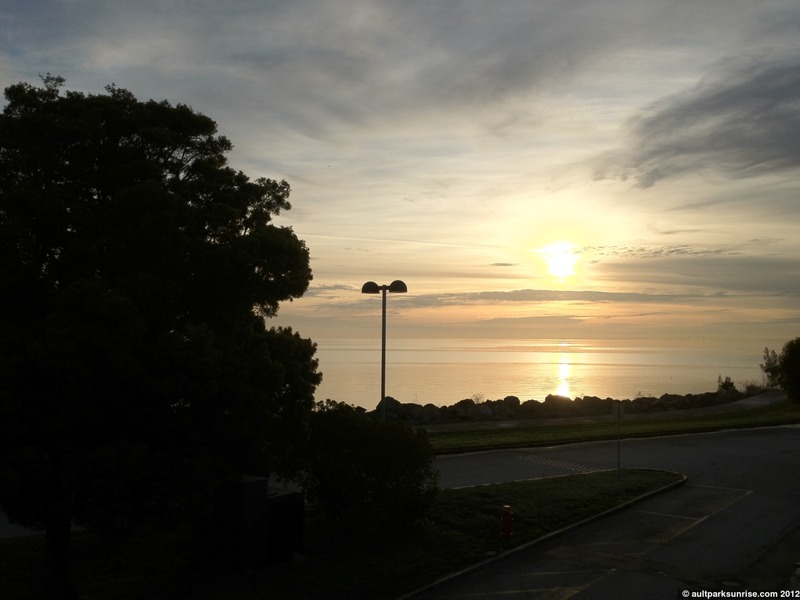 First of all – happy Sunrise 150! While the number is an accomplishment worth celebrating, I’m saving the confetti for the upcoming Sunrise 160 which represents the fourth set of sunrises stretching beyond my original goal of 40. In reality, yesterday *should* have been Sunrise 150. Alright, alright. So this technically isn’t the first snow of the winter. It might be the second… but it’s the first snow that lasted more than a couple hours and certainly the first snow of substance that I’ve featured with this project… even if I’m a day late! What a perfect opportunity, I thought to myself, to have the 150th Sunrise line up with one of the only fresh night snowfalls we’ve had this entire winter. But alas, I pulled a rookie mistake and set my alarm clock incorrectly and so I woke up much too late. I swung by the park on my way to work and snapped a couple of snowy park pictures. 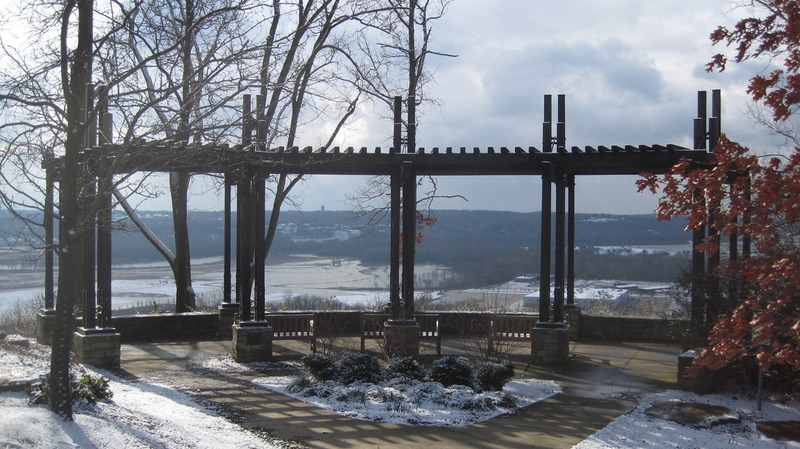 I just *had* to have at least one picture of Heekin Overlook adorned with a fresh snowfall. I’m still holding out for a winter snowstorm, but we’re quickly running out of days! 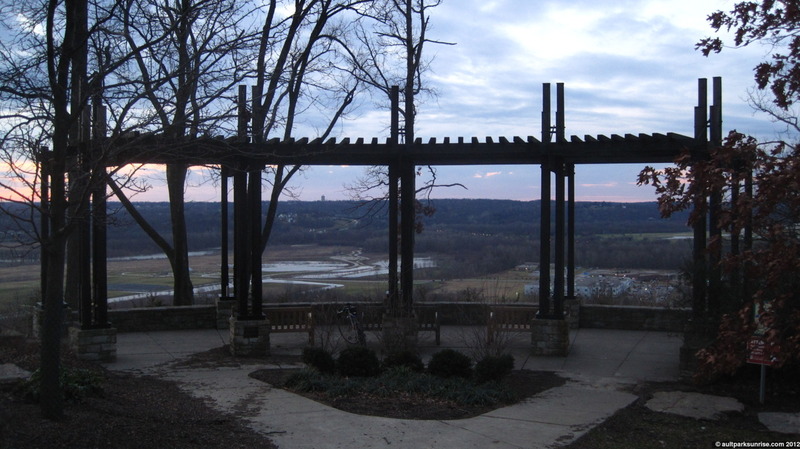 I’m rather excited to also announce one quick thing… there are buds on the trees around the overlook! That means that spring is just around the corner. 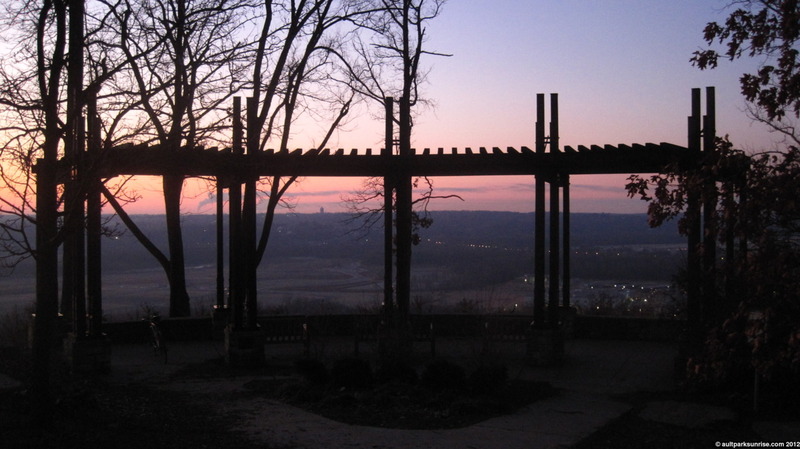 I can’t wait, spring time in Ault Park is such a beautiful thing. The overlook yesterday morning, after a fresh snowfall. 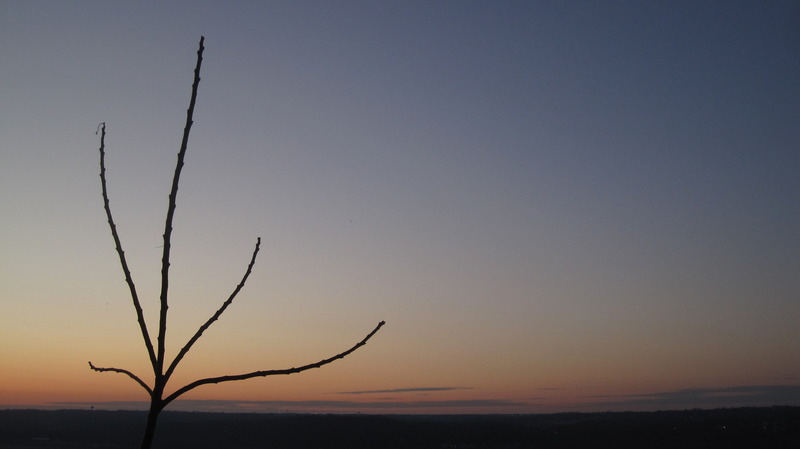 The Tree of Heaven silhouette against a soft & open sky. Look at that! The tree branches have buds! 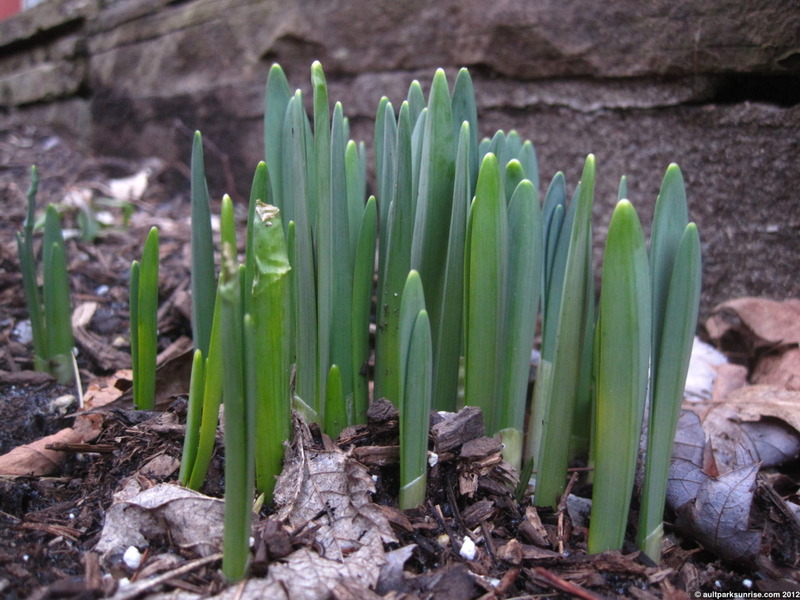 The first signs of spring! I hope you’re as excited as me! 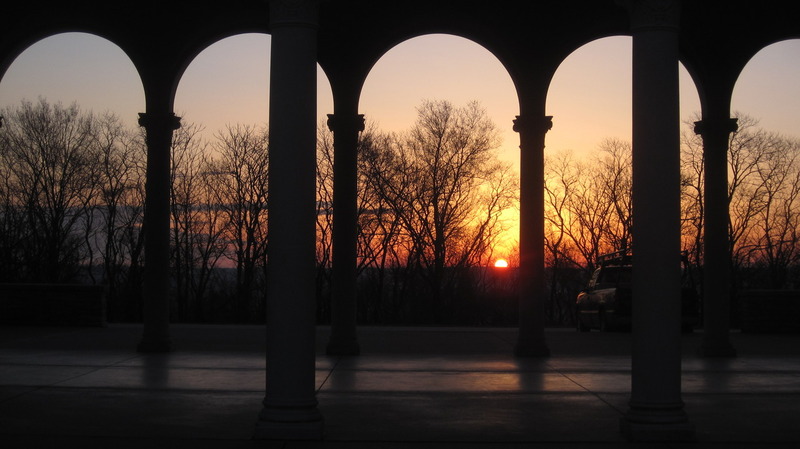 Upon leaving the overlook, I ventured over to the pavilion to check out the alignment of the sunrise. 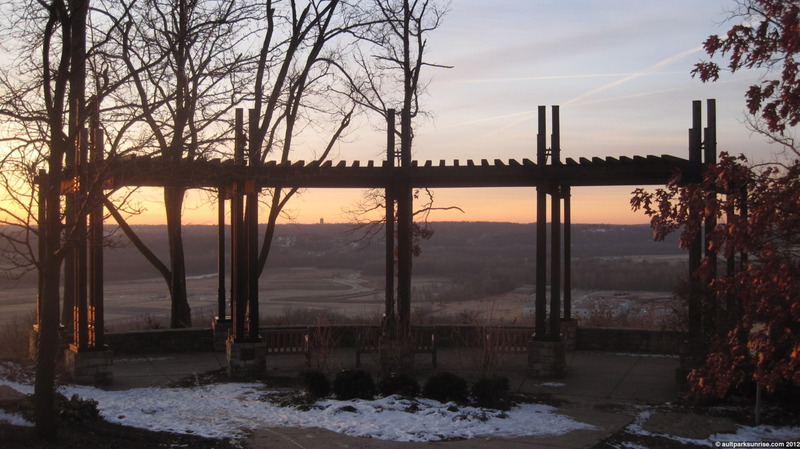 As you may know, I’m privy to finding out on which day the sun rises directly aligned with the pavilion. 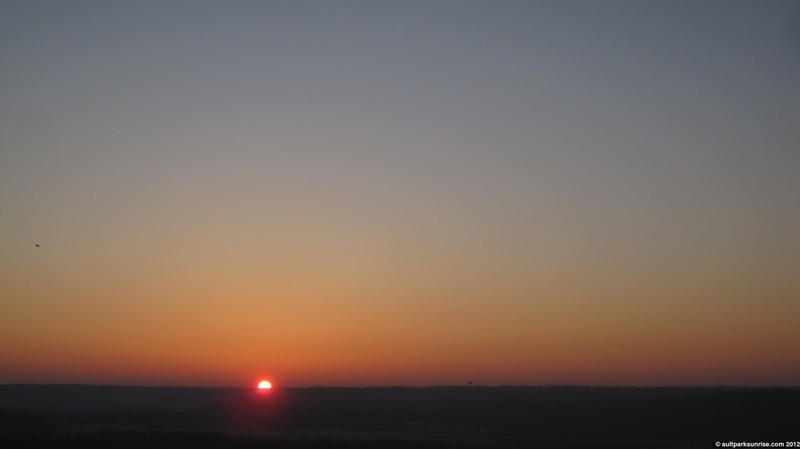 Judging by the location of this morning’s sunrise, we only have a few days (or maybe about a week) left. 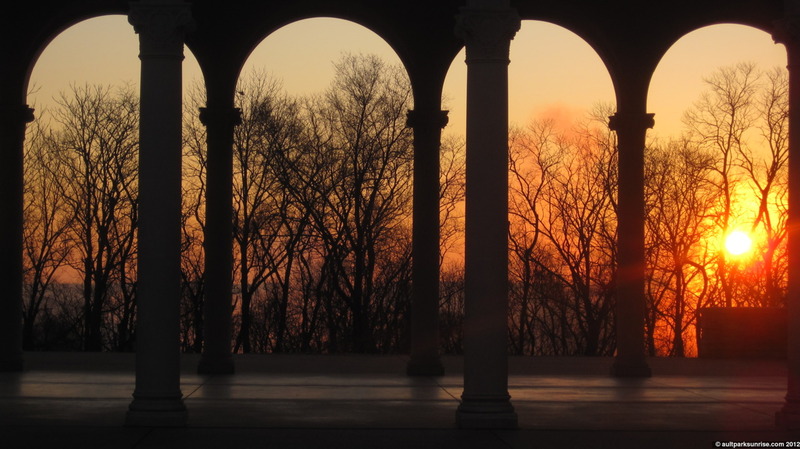 I’m not sure we’ll make it to the first day of Spring… which brings up the question: Is there another day in early march that has an astronomic event that is worth aligning the Ault Park Pavilion, and hence the entire park (through the symmetry about the pavilion) to? Here we begin to see some side effects of my camera’s tiny lens. Check the slight warping around the top of the pavilion, even though the bottom cement appears to be perfectly horizontal. I’m a fan of how the pavilion is separating the oranges and yellows from the blues in the sky. Maybe I’ll try to get this shot another time but with a better perspective. 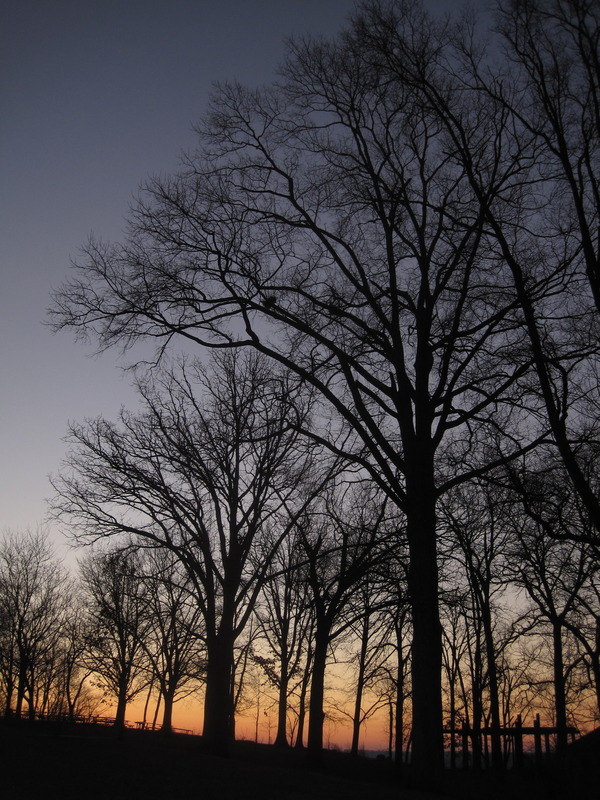 I woke up an hour before sunrise and by the time I left for the park the stars were still visible in the dark sky. 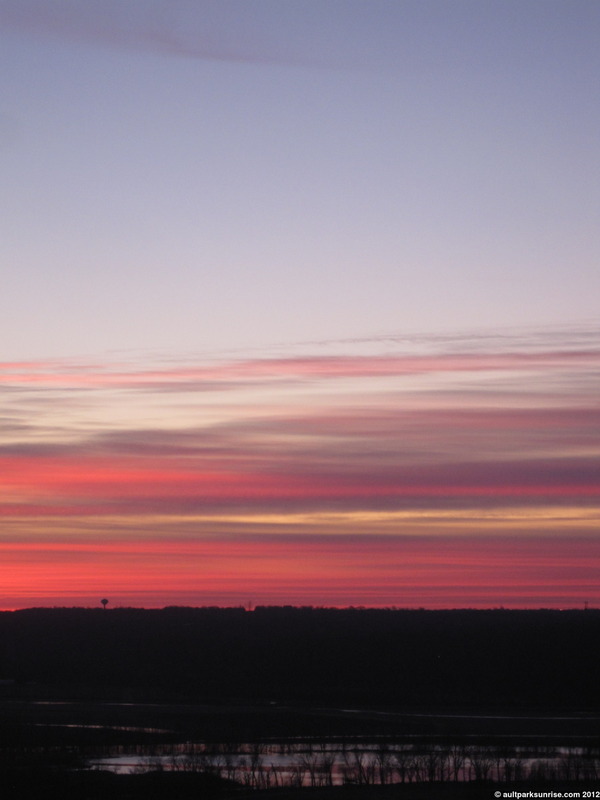 It was another humid sunrise this morning which kept the colors compact about the horizon and subdued. On my ride up to the park there are many steep hills. 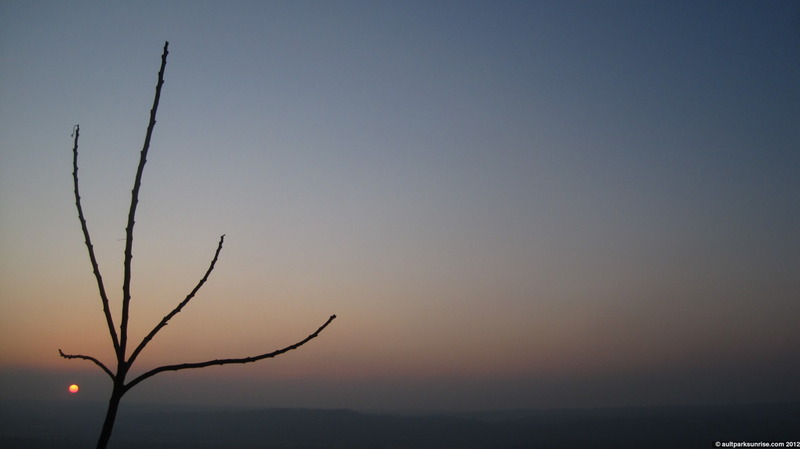 After this particular climb, I stopped to take a breathe and check out the slowly brightening early twilight sky. 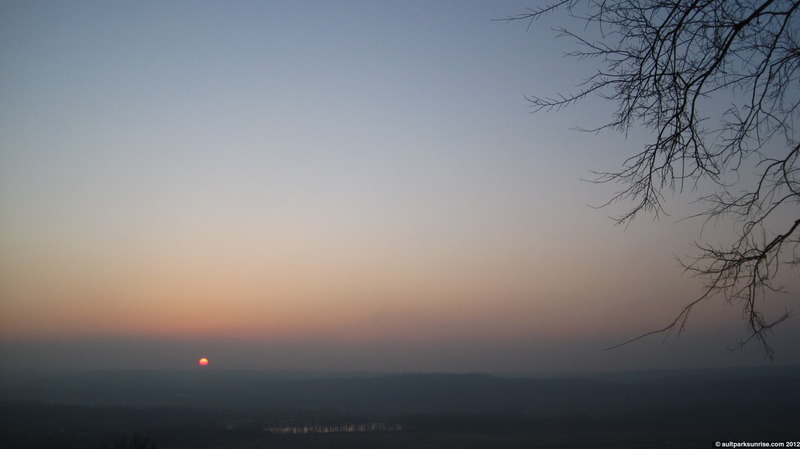 A hazy “First Light” of Sunrise 149. The high humidity, as always, meant that the sun rose a deep orange/purple that didn’t become blinding until a few minutes later. I’m keeping my eye on the sun’s journey across the horizon to see when the day of alignment occurs. I’m hoping it is a significant date, but who knows what the park designer had in mind? 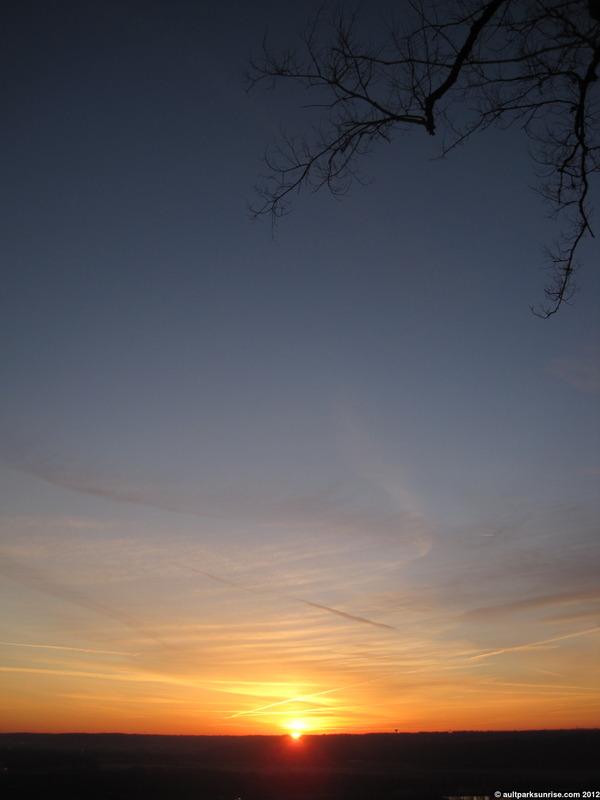 I was hoping that this morning’s sunrise would have been similar to last night’s sunset. 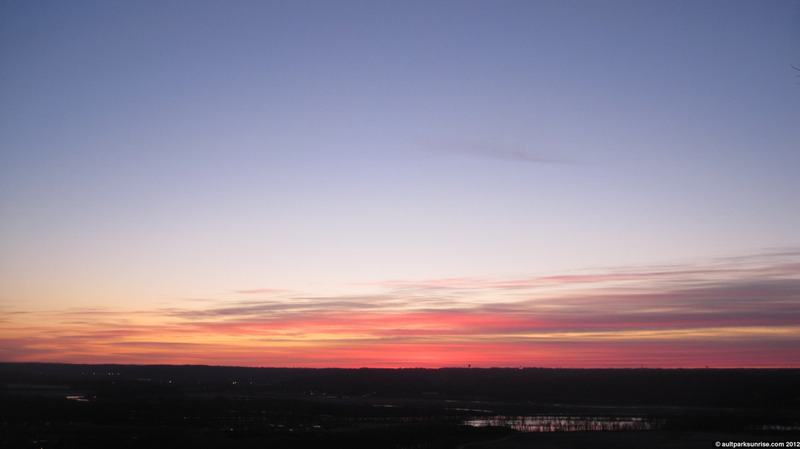 The sunset was a rich pink with streaks of teal open sky. 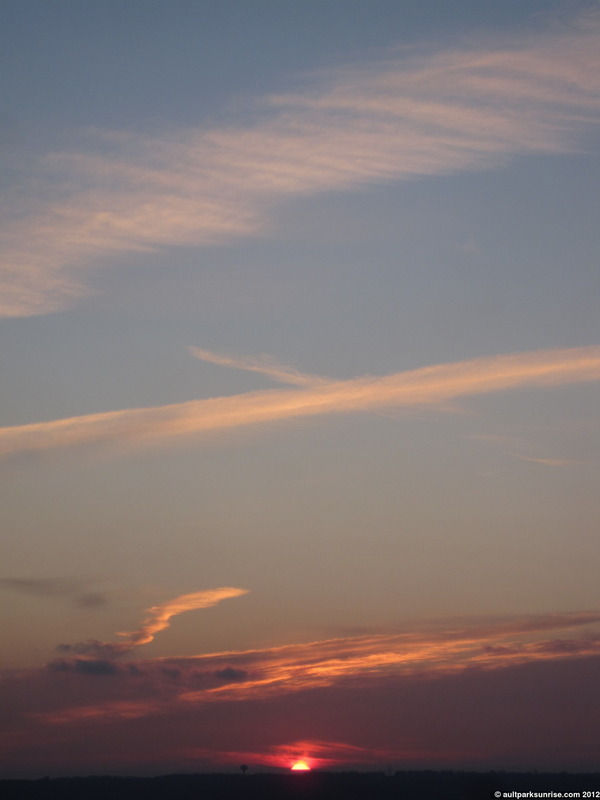 Sunrise 146, while being pleasant in its own right, rose up in a humid atmosphere clear of clouds. It was another sneaky sunrise, one where I thought I had about 10 minutes left to sip on my coffee when suddenly the tip of Sol appeared on the horizon. It was a brisk 20F morning and few souls had ventured out into the park. 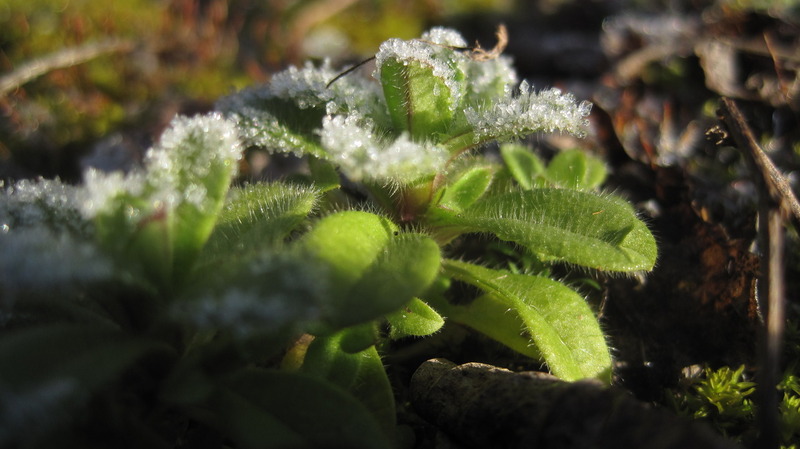 Frost laced the grass around the lawn and the birds were cheerfully calling to one another as if it were a warm spring morning. I could also hear a woodpecker deep in the forest boring into the rotting bark of a dying tree. 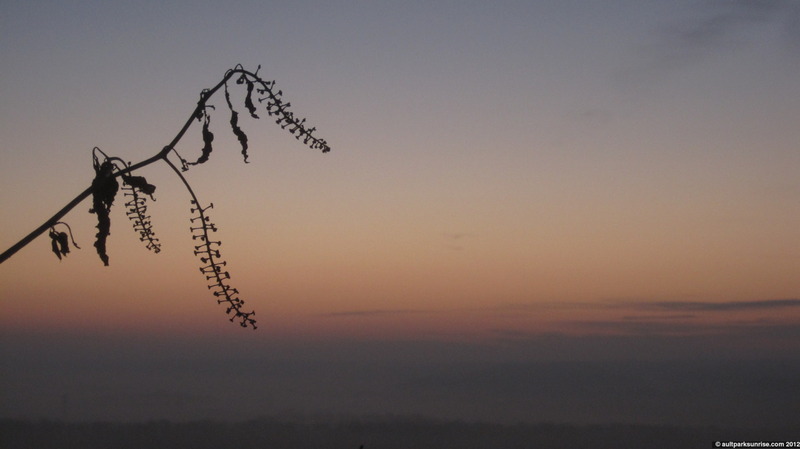 There were hardly any pinks or purples this morning in the humid atmosphere. 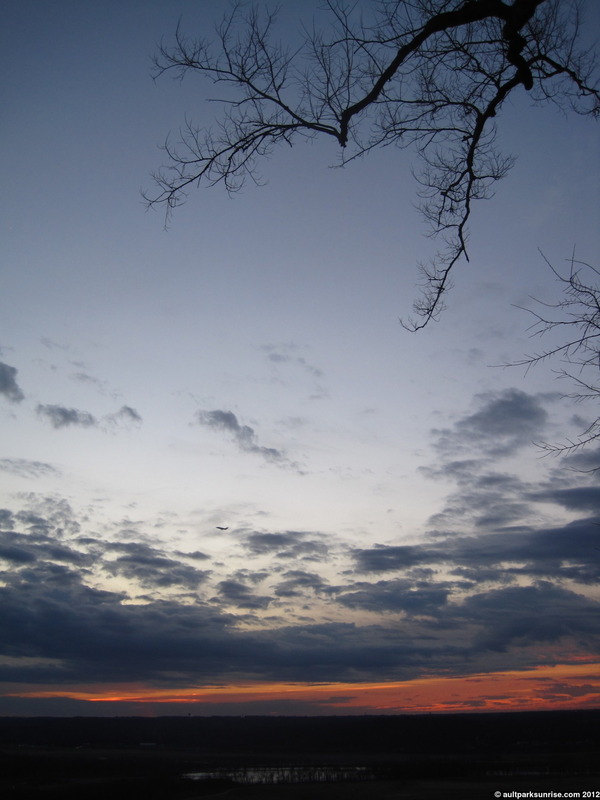 The sunrise was mostly made up of a muted red that faded into a rich orange muddled with gray. I will say I was a bit disappointed as I was hoping for some cloud slurry against a crisp and dry atmosphere, but with spring just around the corner and rain storms forecast for the next few days, the humidity is to be expected. 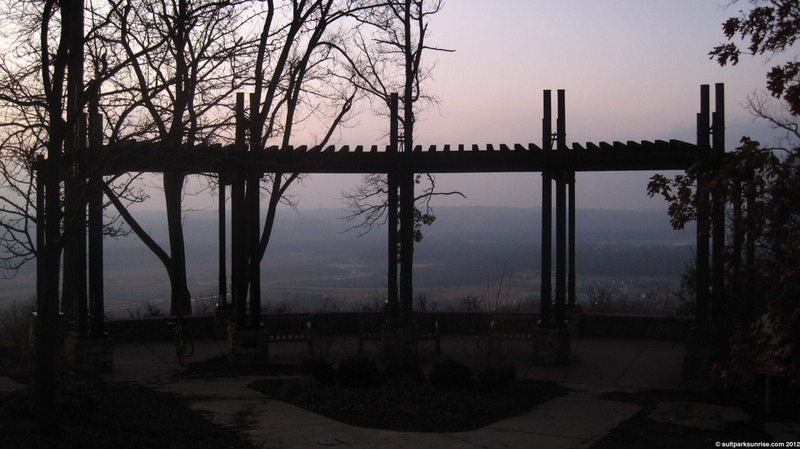 Heekin Overlook at early twilight. 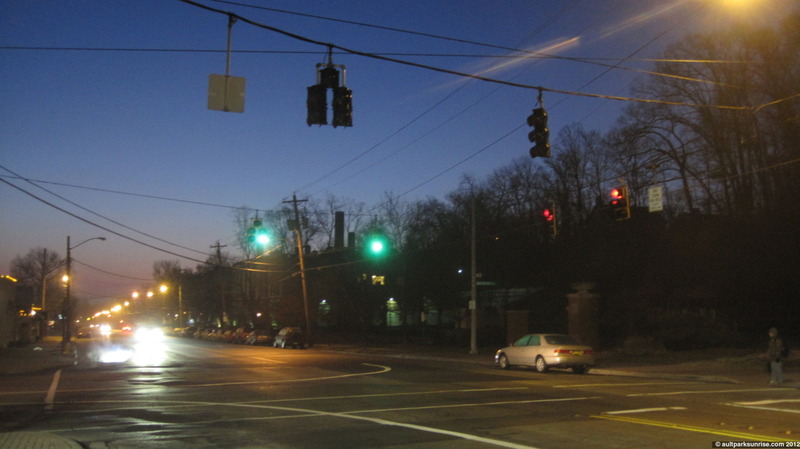 I arrived 20 minutes before sunrise after stopping at UDF for some coffee. The colors were muted, but overall it was a pleasant and chilly morning in the park. 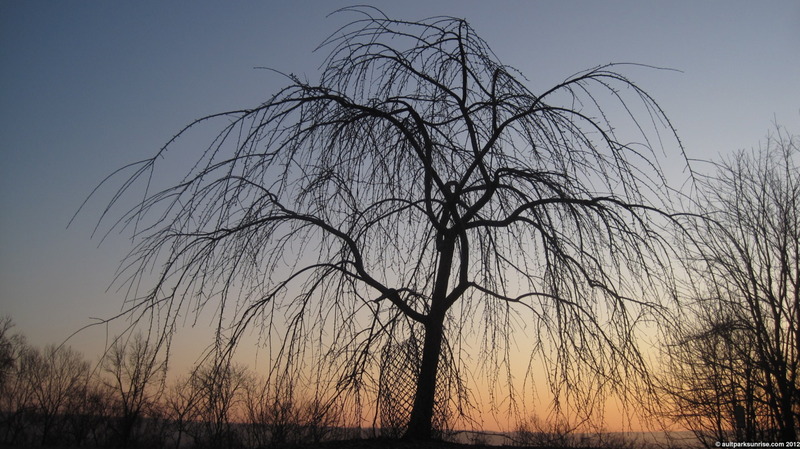 The Tree of Heaven against the twilight. The smoke stacks are puffy this morning. First Light… this sneaky sunrise caught me off guard. Every so often, when the atmosphere is right, the smoke from the industrial site down in the valley drifts visibly into the sky. Prior to heading home, I swung by the pavilion to see how close the sun is getting to the center of the columns as it swings back to the left. Hopefully I can catch it in the middle sometime in the next couple of months. I’m curious as to what day this will occur on and I’m hoping to gain some insight into the park designer’s vision. 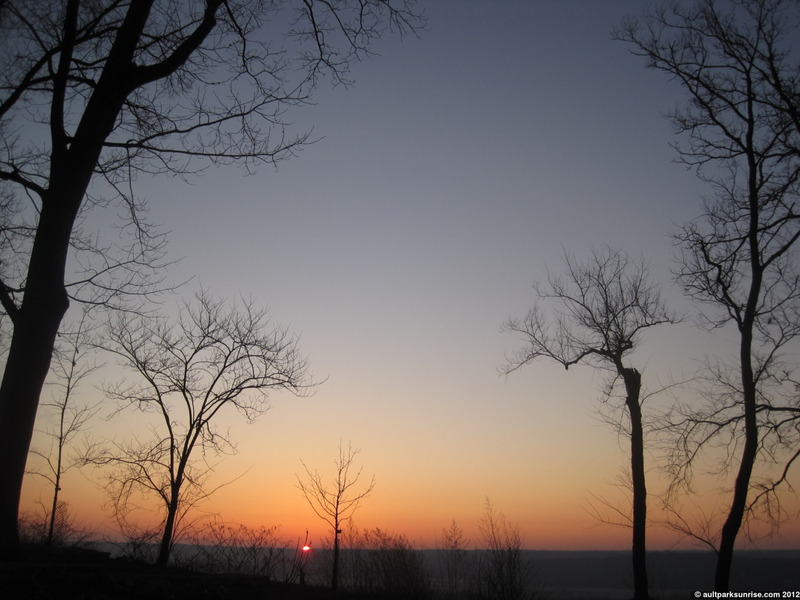 Is there an intentional alignment with the sunrise? 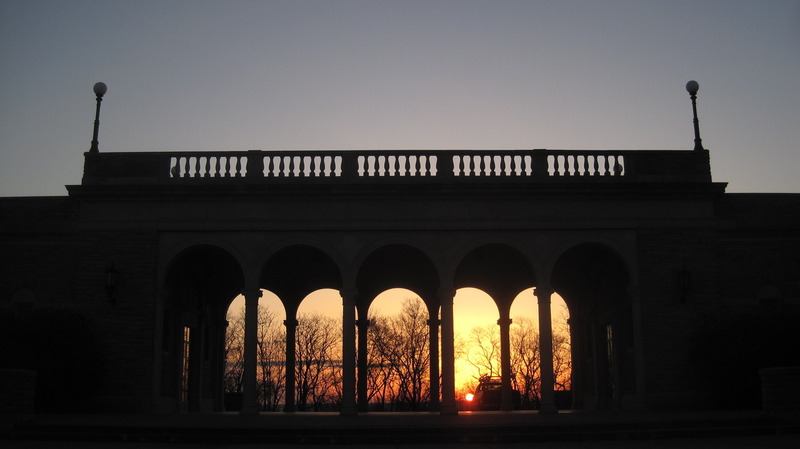 Or is it purely coincidental that the entire park, relative to the symmetry of the pavilion, points directly towards the sunrise? I may be placing my bets on alignment with the first day of spring, but that might be wishful thinking. 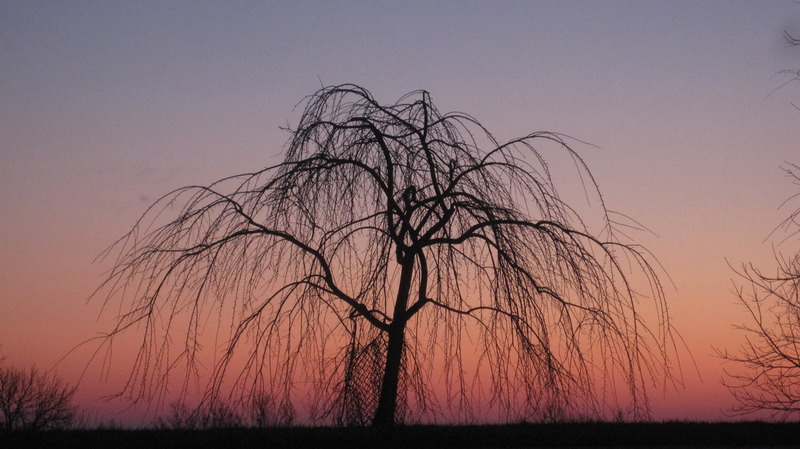 I’m going to guess this is a weeping cherry, although I’m not certain. These are all over Cincinnati and explode into a beautiful bouquet of blooms at the arrival of spring. Sunrise 145; a humid, misty, winter sunrise on this beautiful Friday morning in February. After a bout of rainy mornings I made sure to wake up extra early for today’s clear sunrise so that I didn’t have to rush up the hill to the park. I’ve come to terms with the fact that my new route, while being about the same distance to the park, is substantially more challenging. Armed with this knowledge, I rode up to the park with determination and energy. Fortunately I have mostly shaken the side effects of my head cold so I also had an extra bout of morning energy. The climb to the park was not bad at all this morning which goes to show you how much of life is determined by your mental approach and, to be quite honest, the state your body is in. This morning was forecast to be clear with high humidity. When I strolled out our front door, I found thick patches of mist hanging around the edge of the forests and between houses. The misty backdrop under a clear sky meant that the sunrise colors were subdued and compact, while still allowing for the upper atmosphere to gain a brightness from the approaching twilight. I stopped by UDF for my $1 28oz refill and began my uphill climb (followed by the downhill slalom, followed by uphill climb). The sunrise this morning was of the subtle, sneaky, but uniquely satisfying type. Not wanting to be rushed by traffic and forces of my own control, I woke up 1 hour before sunrise and tried to get out on the road as soon as possible. This put me in the park about 40 minutes before sunrise, a time that would have provided a brilliant magenta display if the humidity was 9%, not 90%. 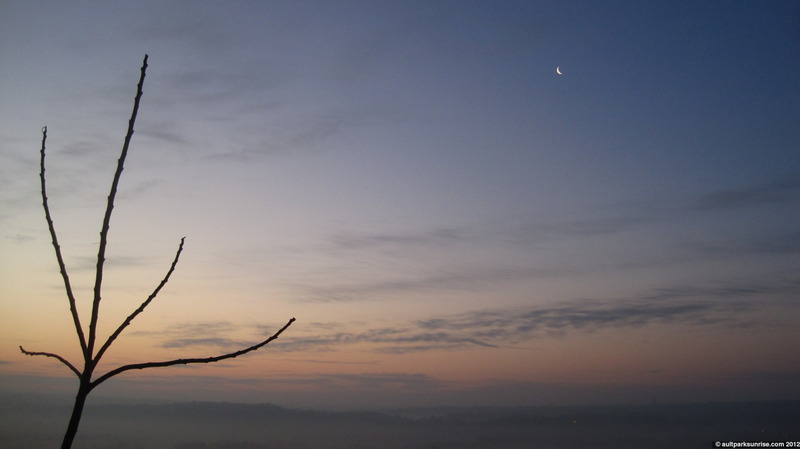 The crescent moon was on display high in the atmosphere, pointing down towards the horizon at the location that the sun was expected to rise. 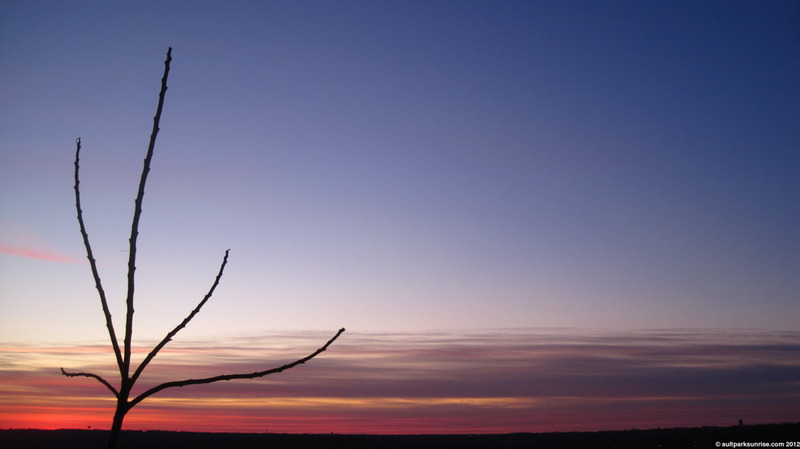 By the way, if you ever see a crescent moon pointing away from the sunrise (or sunset), you’re either dreaming (grab your totem!) or on some bizarro planet. Or maybe woodstock. It’s a nice indicator for checking reality as we know it. The high humidity meant that there was a low lying mist bank down in the valley below. This is always a great accent to a sunrise because it lights up the lower part of the view, throwing lowlights and shadows across the otherwise dark valley. I imagine snow would have the same impact, but unfortunately we just haven’t had more than a single day’s worth of the stuff. The air this morning felt much warmer than I expected, likely due to the high humidity. I also had a visitor in the park this morning, a fellow sunrise cowboy who chose to stay in his parked blue mini. I’ve seen in a couple of times over the last several weeks, so I’m thinking that he’s making a routine of it. 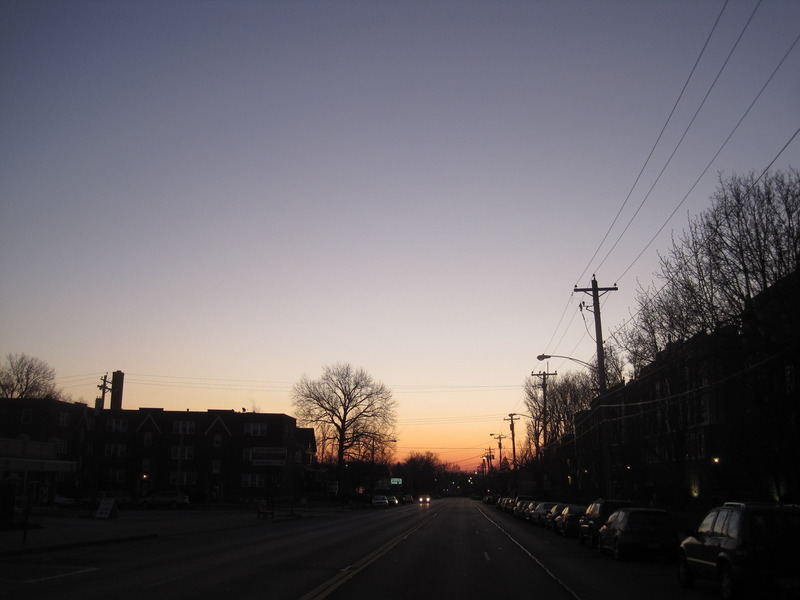 Heading out of the East Hyde Park UDF, the impending sunrise is already attempting to push some colors into the atmosphere but the effort is being hindered by the thick humidity in the air. This is the “downhill” section of my new route. Uphill, then this exhilarating (and tear-inducing) downhill, followed by a fresh climb back up into the park. Good morning! I have been on a bit of a hiatus over the last week so it was great to get out on the bike this morning for the chilly but clear Sunrise 144. Over the past two weeks I’ve been a bit under the weather so I took advantage of the extra hour of sleep that comes with skipping the sunrise ride. We also moved into a new apartment (still near Ault Park of course!) so there has been all of the logistics that come along with that. 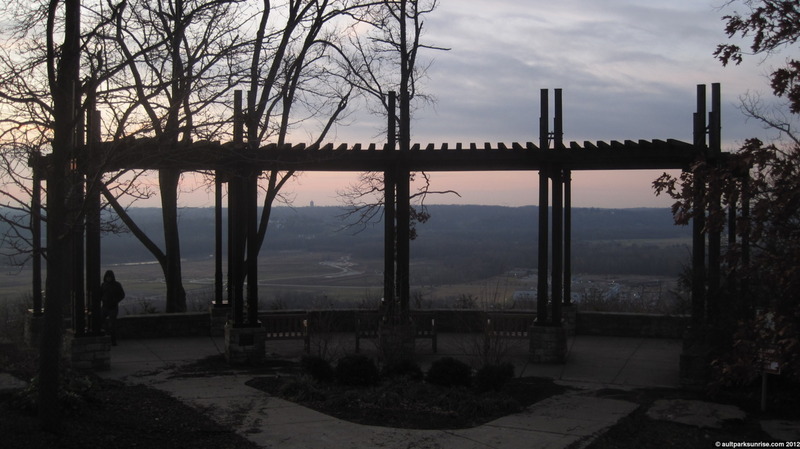 My new location is closer to the other side of Ault Park and it will be interesting to see how this affects the scouting of new sunrise locations. My routine has been a bit messed up lately due to the move, so this morning was a great opportunity to explore my new potential routes to the park. 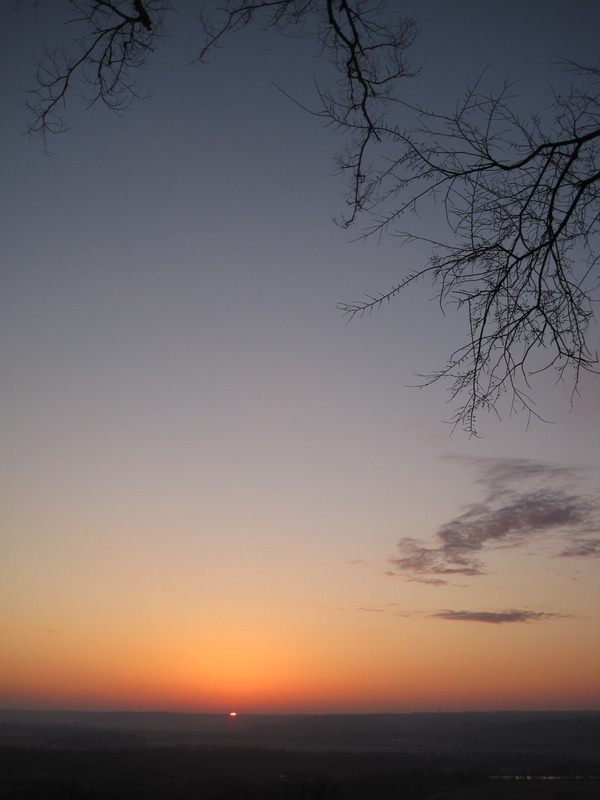 Over the past week the sunrise time has shed about 15 minutes. This morning First Light was around 7:31am, a time that shocked me last night when I found out! 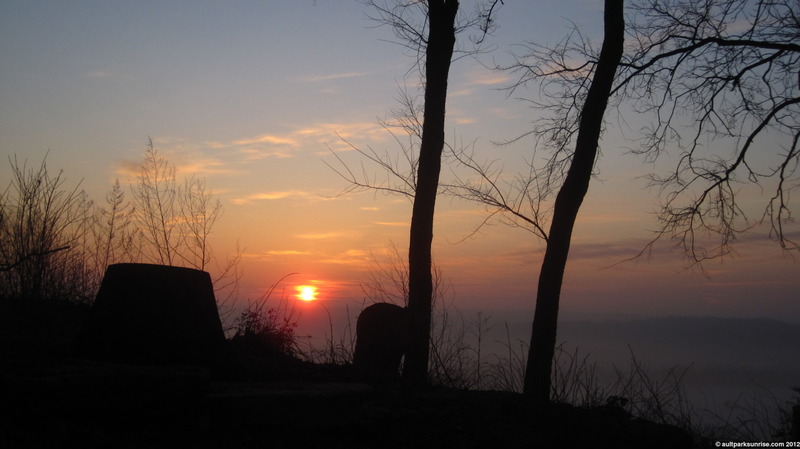 It’s funny how that happens – the daily routine comes and goes, time slips by, and the sunrise keeps on moving along. 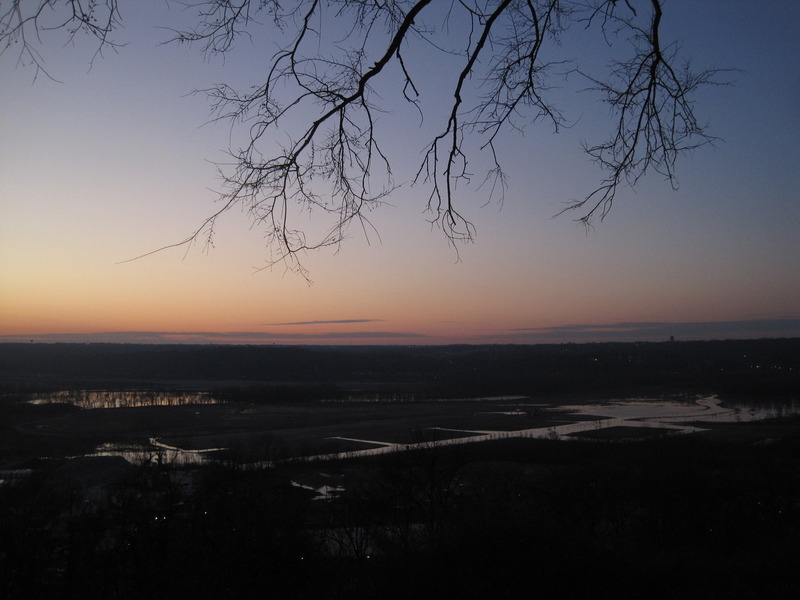 It’s finally getting into “early” territory which means that the sunrise will no longer feel like sleeping in and will start to require a bit more commitment to getting up extra early, a tenant that resonates with the original purpose of starting this project. Now that I know about the beauty of early twilight on a clear sunrise, I have a feeling that there will be some 5:30am wakeups in my not so distant future. Unfortunately I missed the most vibrant phase of this morning’s sunrise. By the time I tracked down all my gear, something I have been nervous about doing since the move, and then grabbed some coffee at UDF, I only had about 15 minutes to spare by the time I got to the overlook. The new route is quite a challenge, too, because I’m approaching the park from the opposite direction. From Mt. Lookout Square, the ride is mostly a smooth uphill. 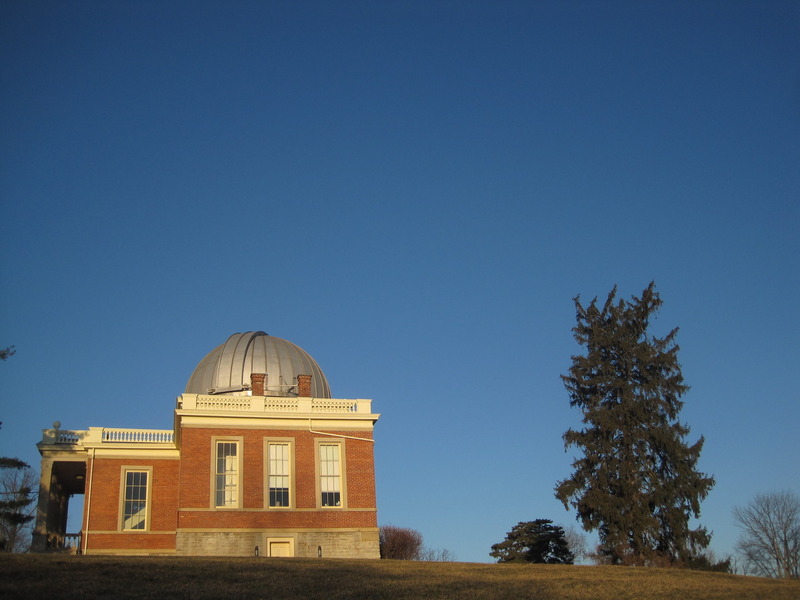 From Observatory, however, it is a steep uphill, steep downhill, then steep uphill again. It really gets the blood pumping. It is a nice challenge though as we approach the one year anniversary of the project. The sunrise this morning was set against a crystal clear atmosphere with a nice set of vapor trails and whispy low horizon cloud action. Last night I could see a whole set of stars up in the sky after sunrise, including a bright appearance of a planet (is it Saturn?). 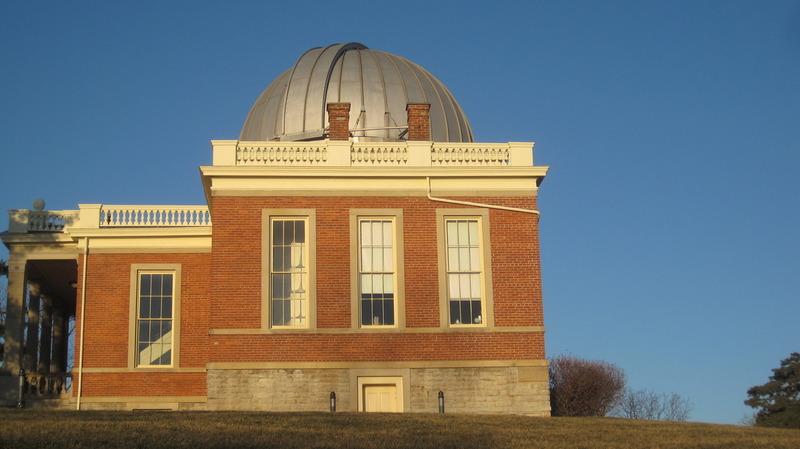 The stars were awfully bright last night, meaning that if the sky held this morning’s sunrise would have started the show up to an hour, or more, before sunrise time. 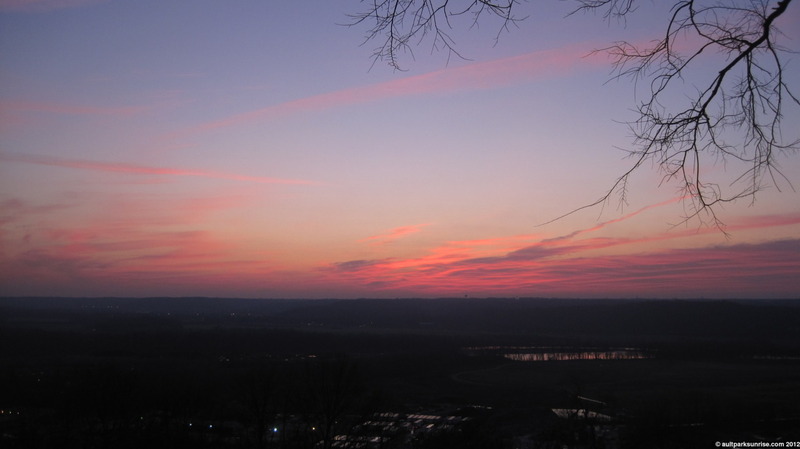 This was indeed the case this morning and while the sky was continually changing from the time I was out of bed at 6:50am until I arrived at the park at 7:20am, most of the pink and magenta colors had mostly dissipated early in the twilight. 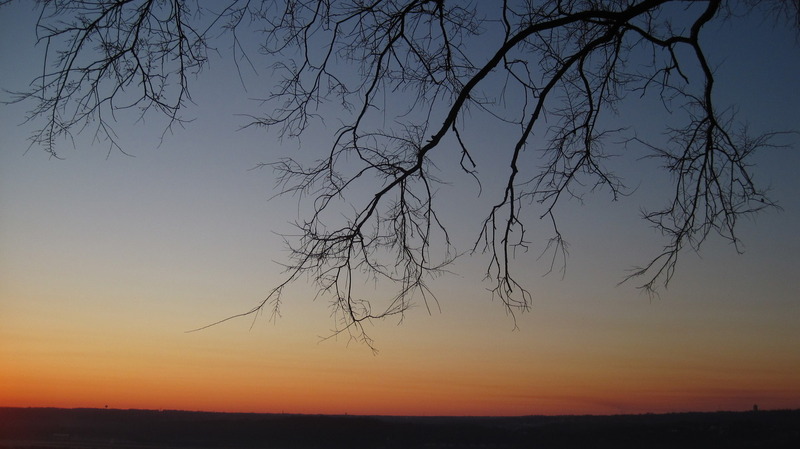 The late twilight colors were a glowing set of orange with bright yellow streaks reflecting off of the ice crystals embedded in the vapor trails high in the atmosphere. 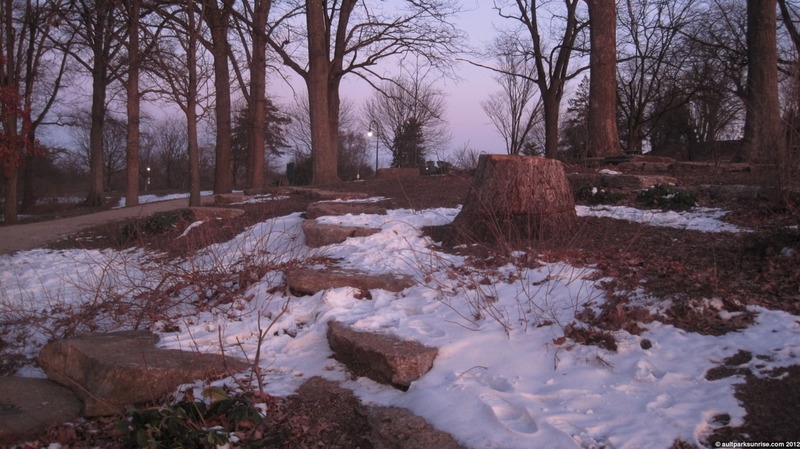 There is still a bit of snow left in the park, although it’s more of a sprinkling rather than a coating. That’s my one regret from this 10 day hiatus is that I missed our most recent snow storm that came through with a fury after the January warm streak. There’s no worry though, because while it was a pretty snow fall, the warm ground didn’t let more than a half inch accumulate. I’m still waiting for the freak midwest snow storm that we deserve! The weather man is calling for some snow tonight so we’ll see where that ends up. Now that the temperatures are finally cold enough for snow, getting as low as 9F this morning, I think it’s just a matter of time until we get a decent snow fall. Heading into the park past the Cincinnati Observatory, I can tell that the vibrant magenta display is already fading out. 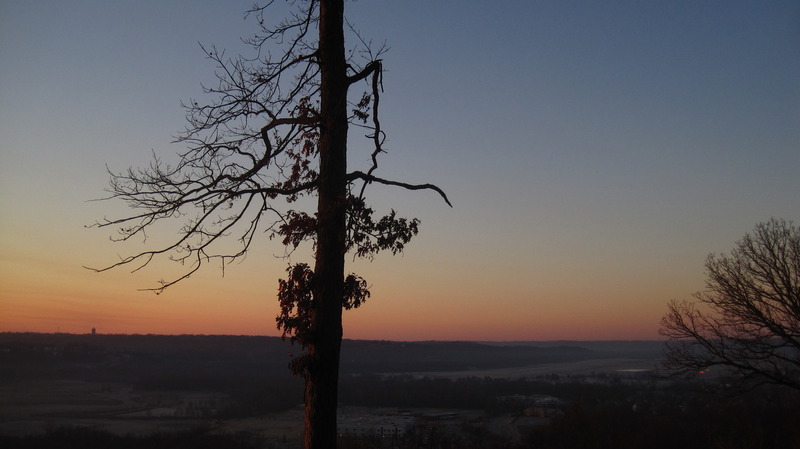 I arrive at Heekin Overlook on this chilly winter morning during the final phase of late twilight. 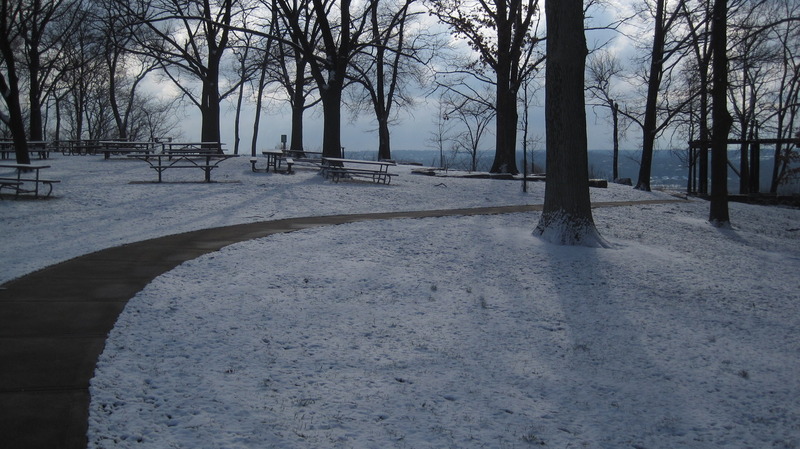 The edge of the hill where the overlook sits still has a good amount of snow. The cool winds coming up from the valley likely provide a little micro climate that protects these snow piles during the warmest part of the day. 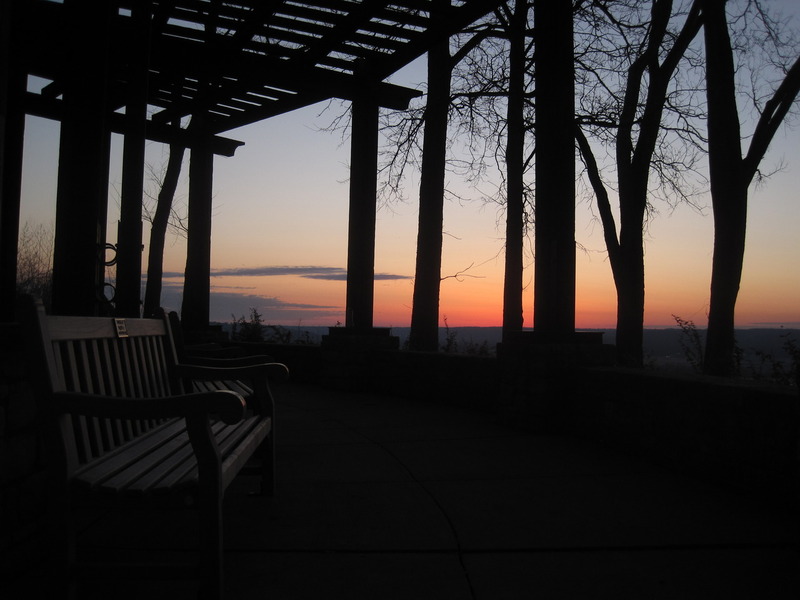 Sunrise 144 @ Ault Park. 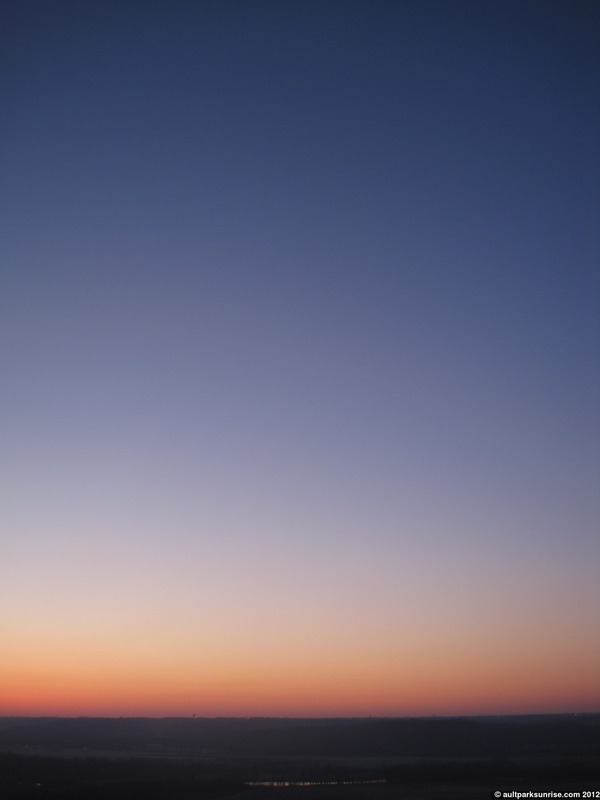 The ultra-clear atmosphere means that the intensity of the sunrise is extreme from the get go. 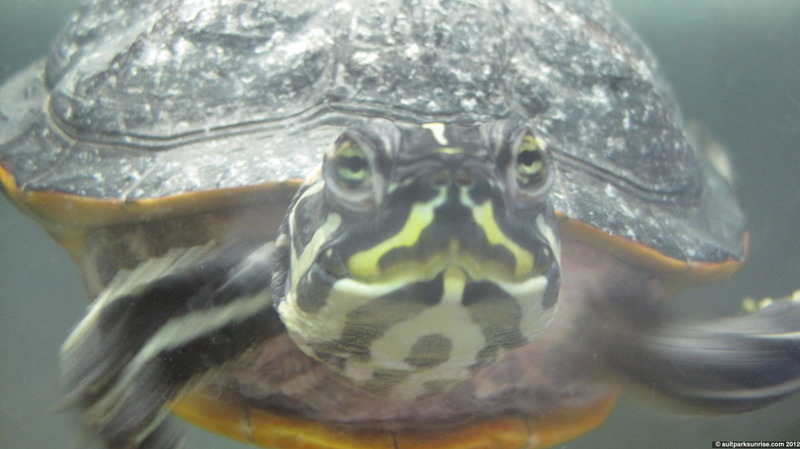 And finally, here’s a blurry picture of Mike the Turtle, our six year old native painted turtle. He’s enjoying his freshly cleaned aquatic home and his 5 new fish companions. I had to make sure to get extra-lively feeder fish this time because their predecessors didn’t make it very long. These new ones have no problem skirting Mike’s lazy attempts to catch them. He usually gets bored after the first day so it looks like they’ll do just fine. The Tree of Heaven rising into the sky as our organic spaceship spins towards the solar globe that is giver of all life. After missing a brilliant magenta show during the early stages of Sunrise 142, I was determined to get up to the overlook with time to spare… just in case. 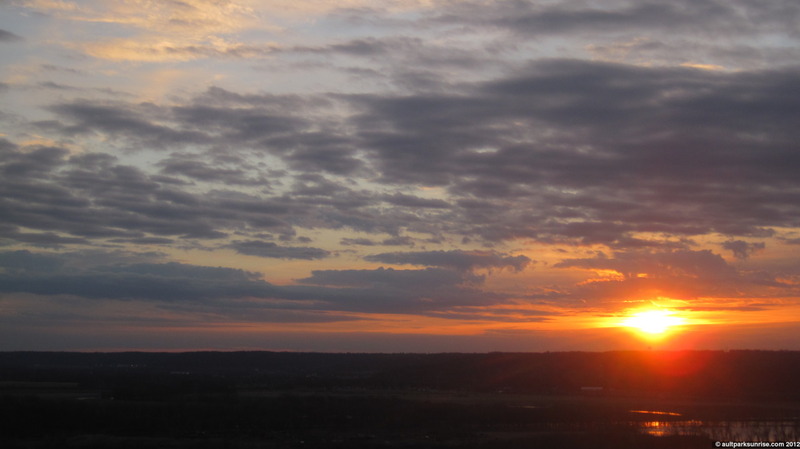 As it turned out, Sunrise 143 was not unlike some of the early April sunrises. 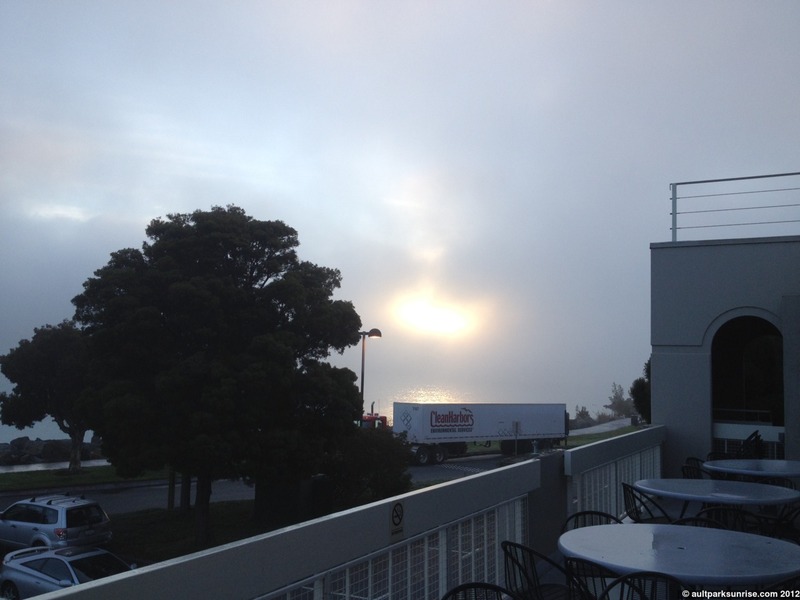 It was incredibly humid this morning, with a dense mist that limited visibility. 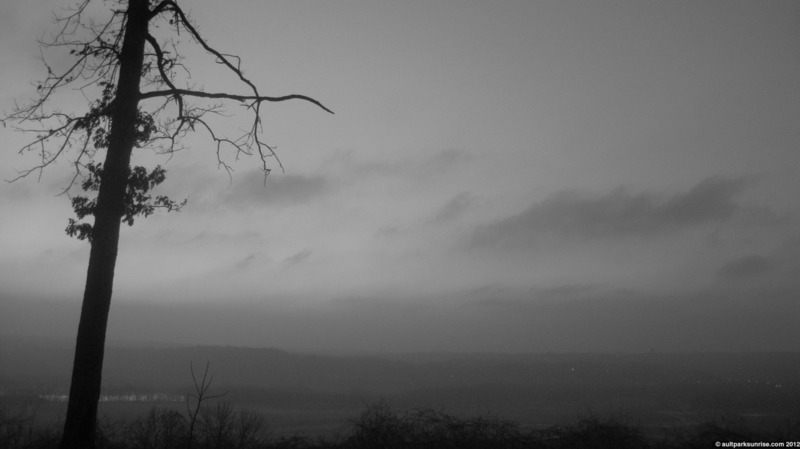 The distant ridge line faded into the gray atmosphere and the thick moisture prevented the sunlight from scattering into the upper atmosphere. 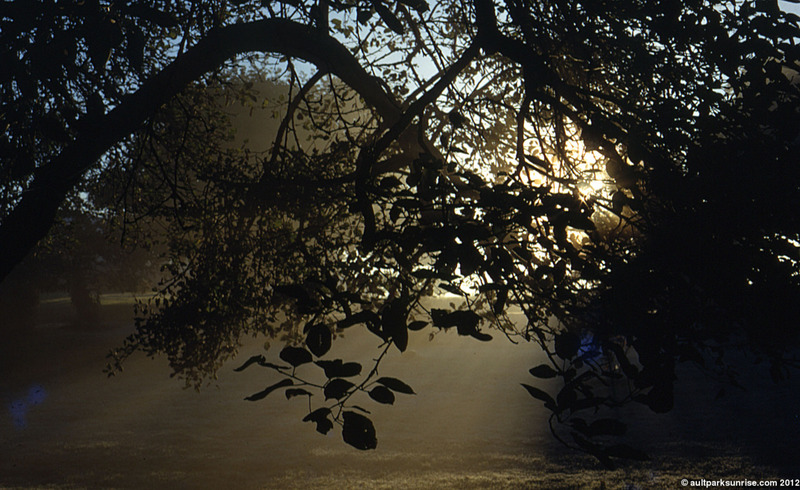 During these humid mornings, the sun rises slowly without an introduction. She typically comes up through the gray horizon, glowing a deep majestic purple that one can stare at for a few minutes before the curvature of the earth and the less dense mid-atmospheric air allow more light to get through. 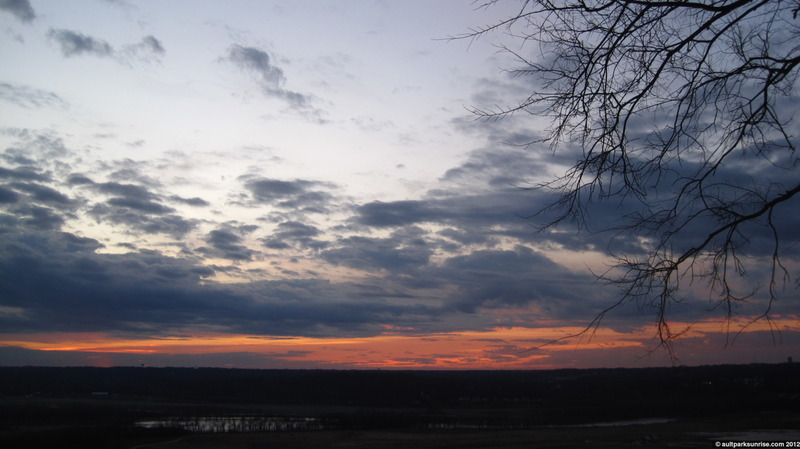 The early twilight sky was dark with only a light glimmer of orange developing against the gray. 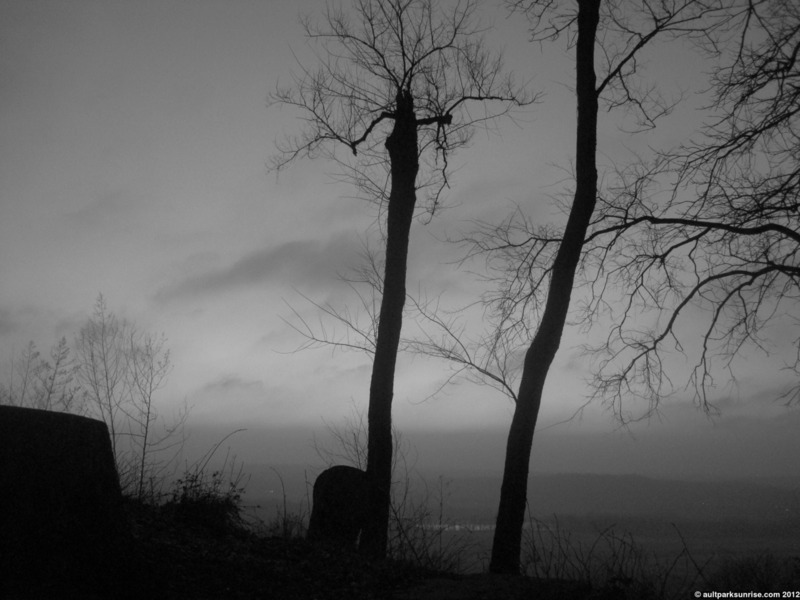 Black and White mode helped bring out some of the contrast in the low light. 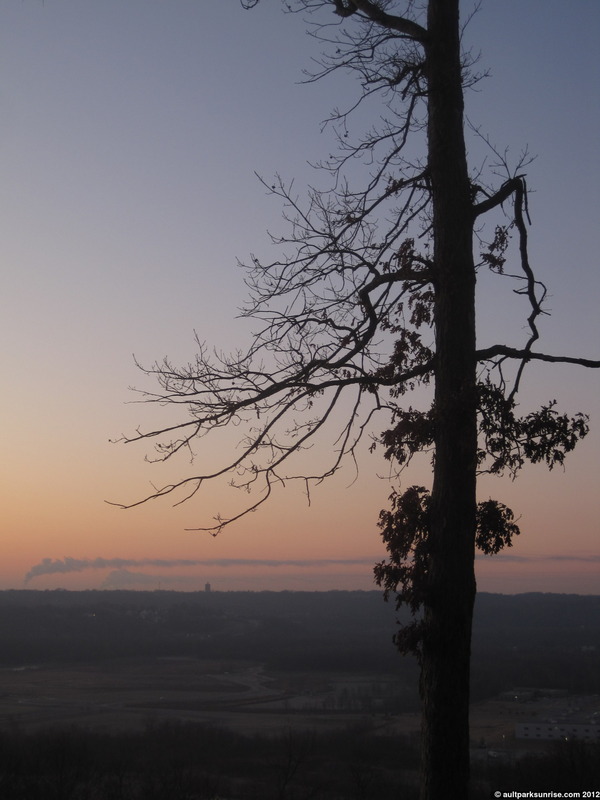 The lower overlook and the single tree that hangs out over the valley, a favorite hangout spot for the local birds. The birds were quite active this morning, by the way. They’re loving this February spring weather. 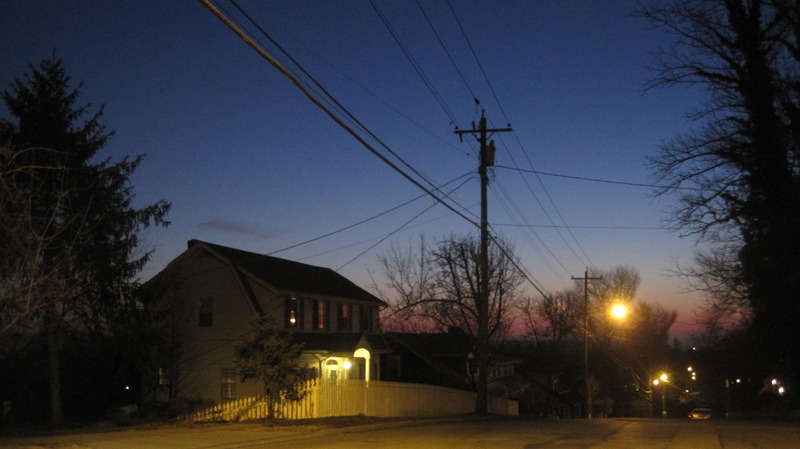 About ten minutes before “First Light”, the sky shows little sign of the impending sunrise. Heekin Overlook against the misty valley. High overhead a big airliner ascends into the upper atmosphere. I’m going to take a guess and say that it recently took off from Dayton Airport, given the fact that it was still rather low and it was not heading for Cincinnati Airport from what I could tell. I woke up this morning and peered out the window. I saw two things. First, a family of deer were munching away in our lawn. Four young females taking advantage of the warm morning. They were about 7 feet outside our back window and just stared back at us, chewing grass, when we opened the blinds to say hello. 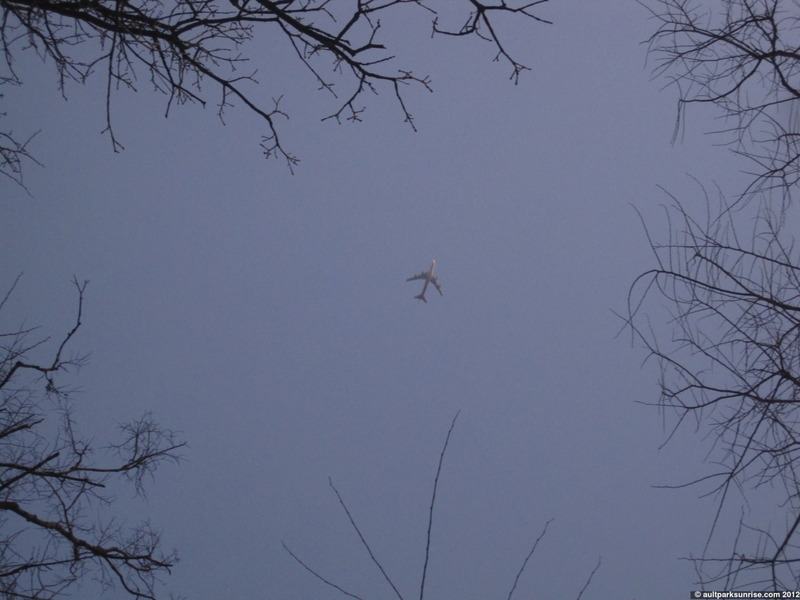 Second, I noticed that while the upper atmosphere was clear, there was a huge cloud bank in the lower half of the sky. Normally this means no sunrise for me, so I took my time getting ready before heading up to the park. 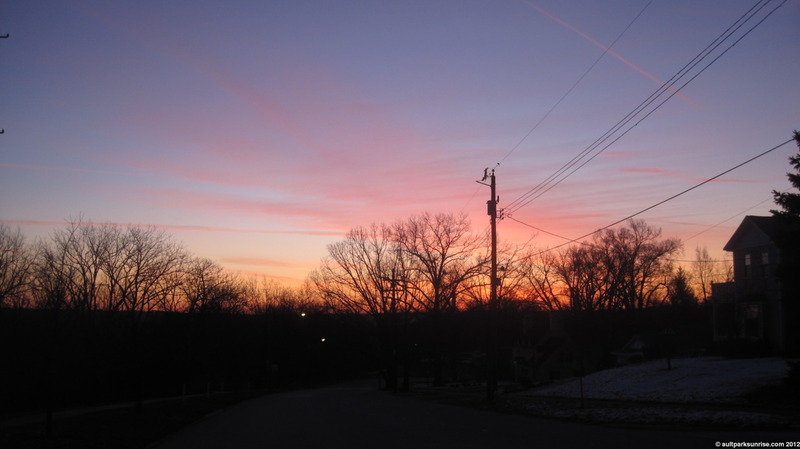 You can imagine my surprise when I rounded the corner on Linwood Ave and saw one of the most brilliant displays of pink and magenta just above the horizon. 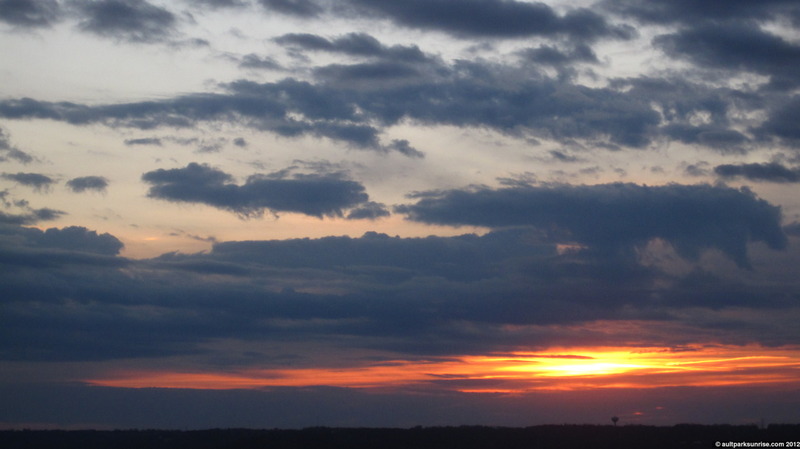 As it turned out, the lower atmosphere had a clear opening under the cloud bank and I was missing the show! I arrived at the overlook just as a family of 4 (humans, this time) were packing up their things. The sky had faded to a dull orange, and I confirmed with them that I was 5 minutes shy of missing a beautiful pink sunrise. Too bad! Whenever I figure out that whole time traveling bit, I’ll be sure to set it to January 31 2012 for a guaranteed unique sunrise. 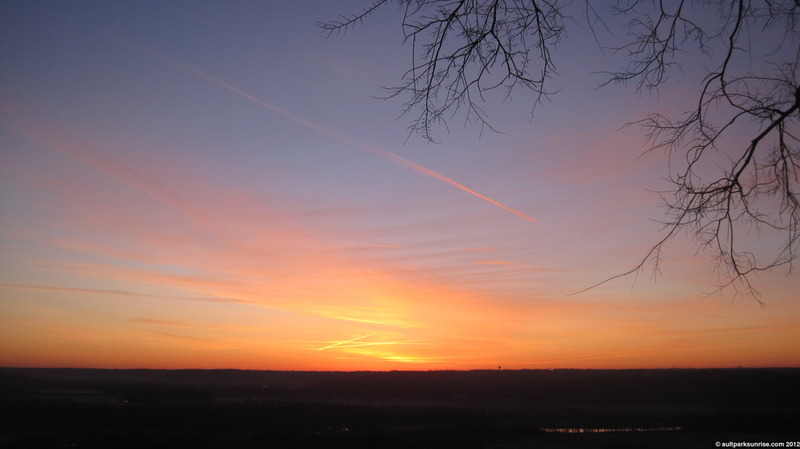 The sunrise this morning was not unlike the sunrises of April 2011 – dynamic, moody, and full of change. In other words, exactly what you’d expect on a day whose temperature is 40F higher than what you’d expect. 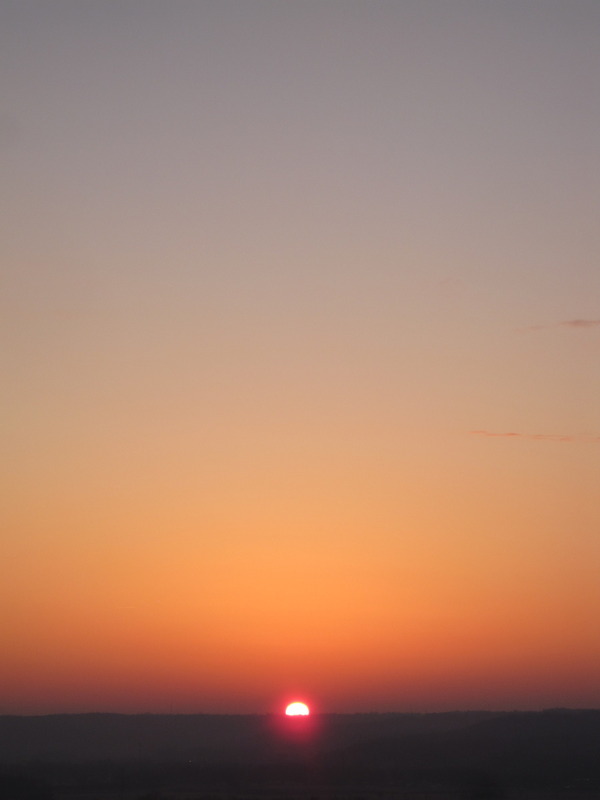 Let’s hope that the next sunrise is of similar style so that I get a second chance. Although, to be fair, I haven’t adjusted to the fact that the sunrise is slowly creeping earlier each morning as our countdown to summer continues. I’m still mentally prepared for an 8:00am sunrise, so the 7:44am sunrise of this morning actually did catch me off guard. 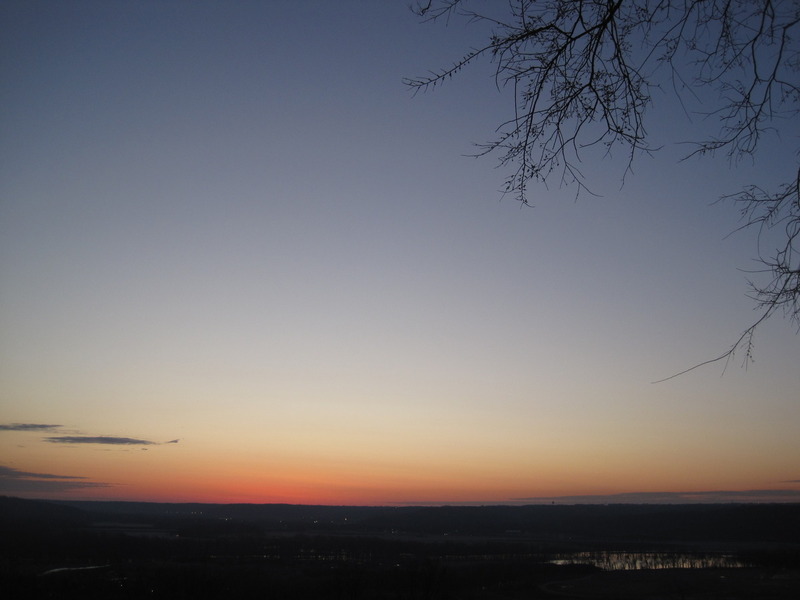 Now that I know about the majesty of twilight colors, sometimes up to 45 minutes before sunrise, I’m thinking that spring and summer of 2012 may be even more of a challenge than 2011, considering I’ve moved my arrival time from 10 minutes before sunrise to a half hour before sunrise. It is, however, totally worth it. 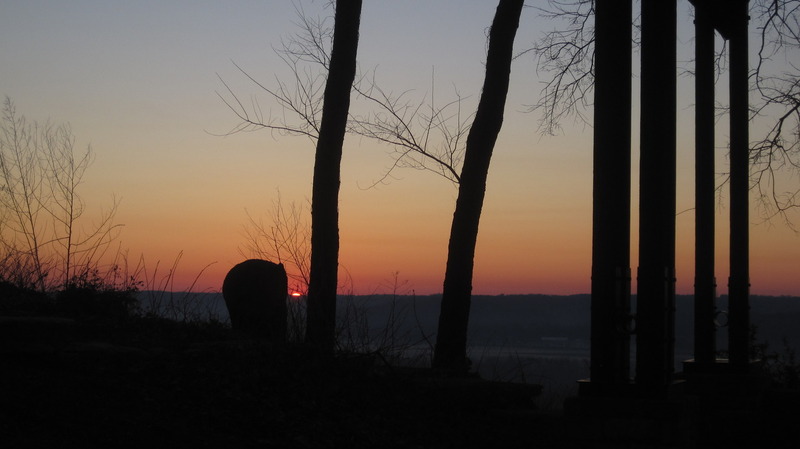 During the past couple of days I’ve received three sunrise pictures, so I’ve included them here in our sixth Guest Sunrise post. One is from Trent, another shot of the San Francisco sunrise, one is from Leah who is visiting Florida, and the other is from Amanda (the wife unit) who went to work a bit early this morning and caught the sunrise on the way to work. Thanks for submitting everyone! 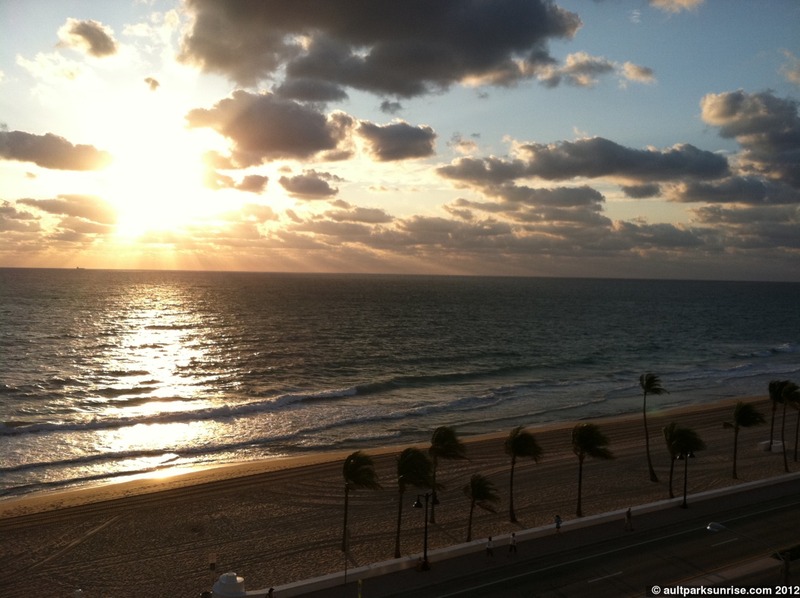 Ft. Lauderdale Sunrise. 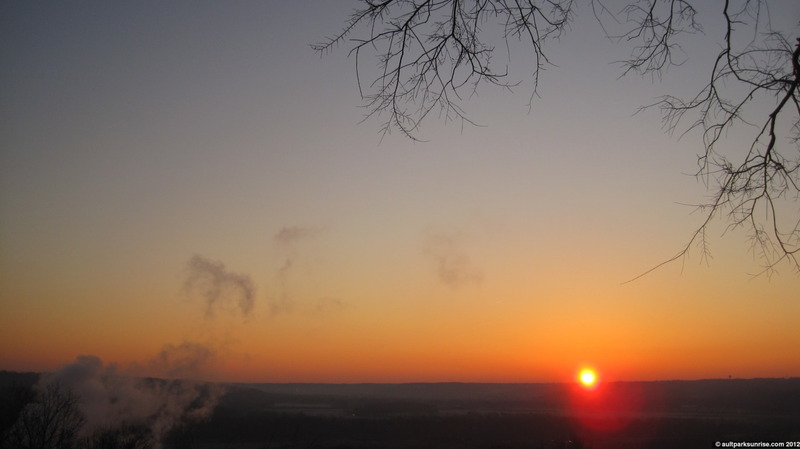 Thanks for the East Coast sunrise Leah! San Fransisco Bike Commute Sunrise. 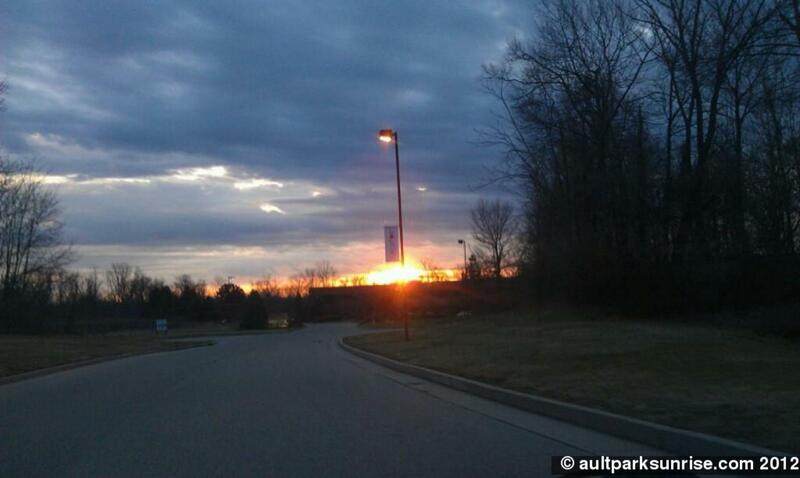 Thanks for another sunrise contribution Trent! 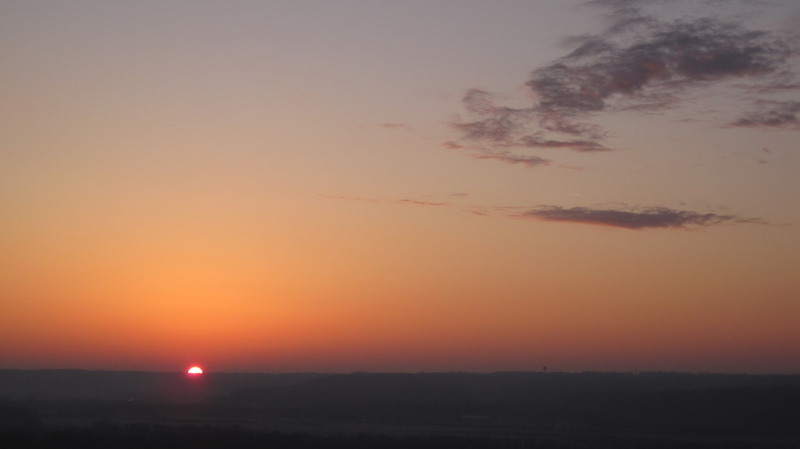 Erlanger, KY Sunrise. 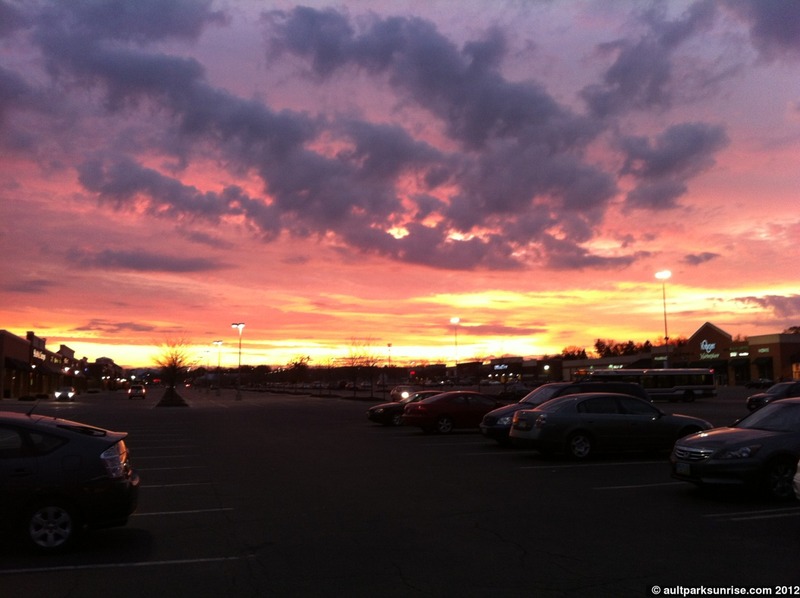 Thanks for the second viewpoint of this morning’s sunrise, Amanda! 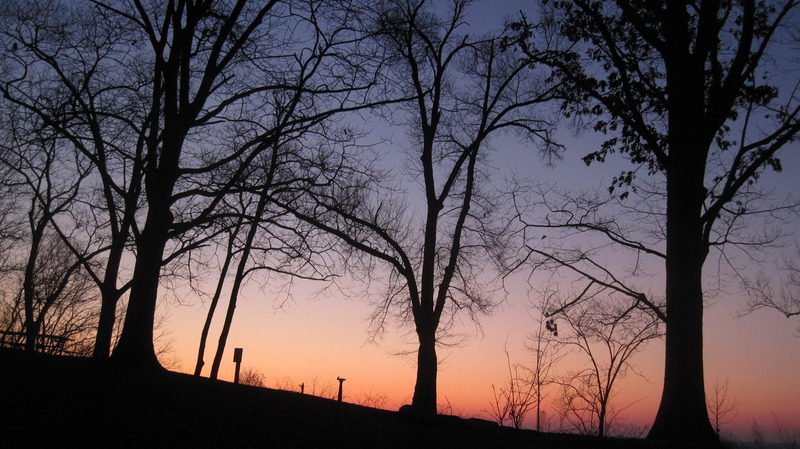 The late twilight sky as I arrived at the overlook in Ault Park. To think that just 10 minutes prior, all of that orange would have been a blazing pink and magenta display. 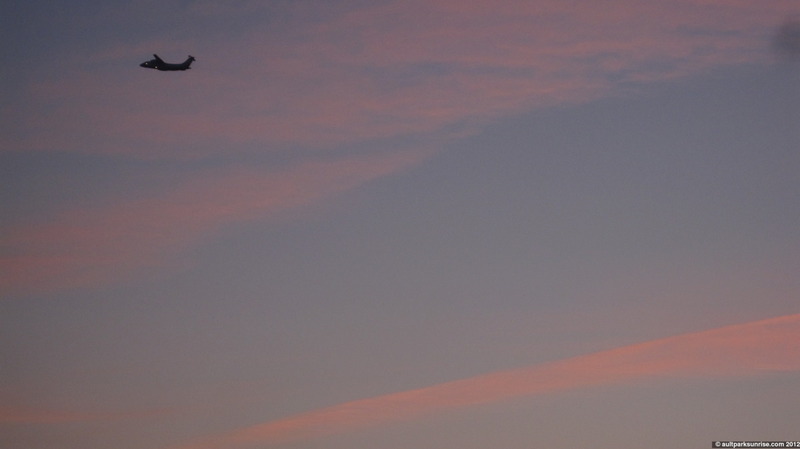 A plane takes off into an atmosphere that is slowly getting brighter as we approach sunrise. 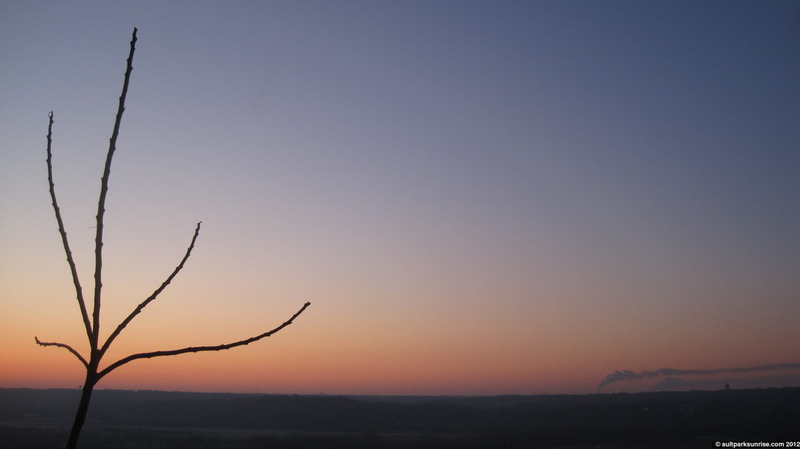 This is an iconic “Spring Sunrise” atmosphere, which is strange since it is January 31. Heekin Overlook. Armleder is flooded again. It is worth noting that Armleder was flooded last spring, another sign that this is unseasonable weather. Some crocuses (or tulips?) coming up through the mulch out in front of our place. They’re a bit early (at least a month, maybe two); hopefully they don’t get killed by the next hard freeze! 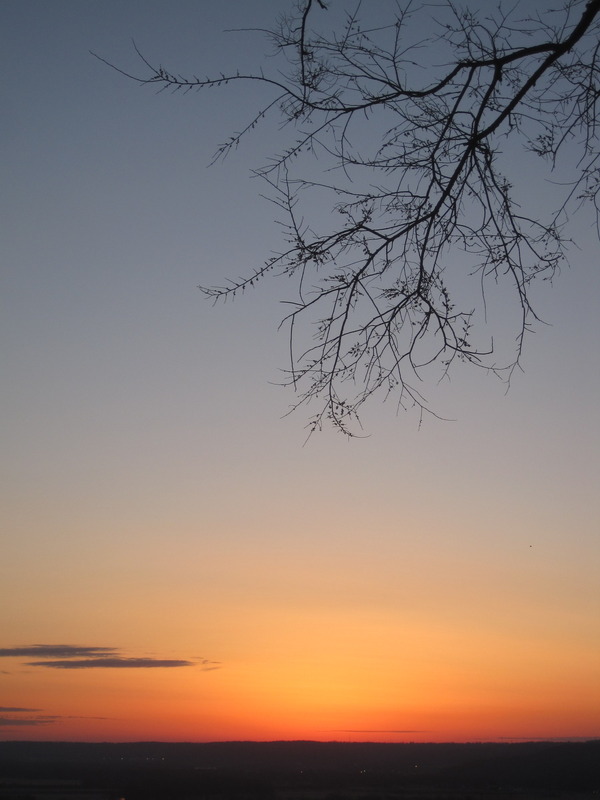 After a week of rain and ice, this morning we finally had a beautiful clear sunrise. There was some intense wind activity yesterday afternoon that preceded a breaking of the overcast conditions in the tri-state area. The weather has held and it looks like we’ve got some great weather lined up for the next couple of days. 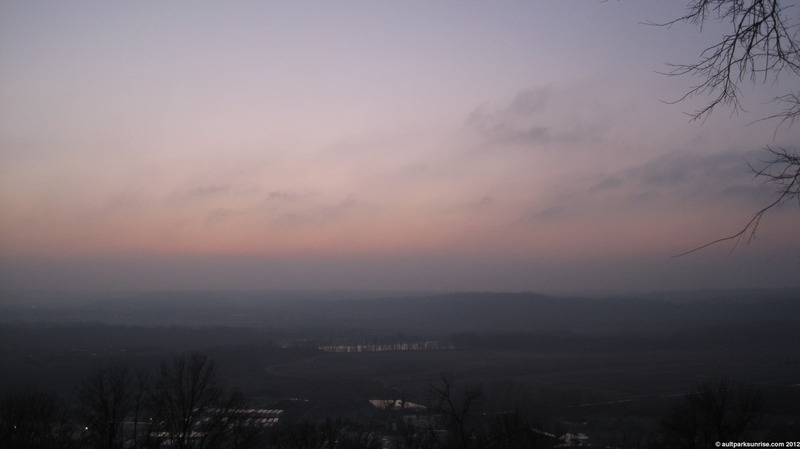 It was a humid sunrise this morning and this was evident in the late-twilight orange/yellow/gray colors of the haze. 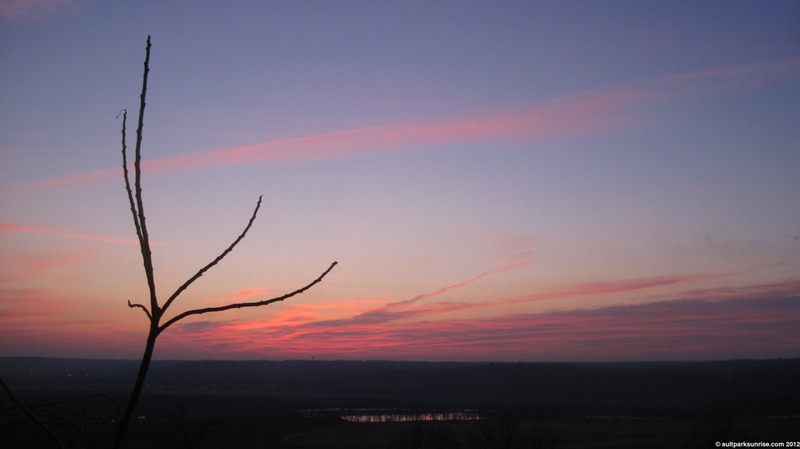 The early twilight was another splendid magenta-filled canvas that slowly faded into a dull yellow/gray sunrise that was mostly blocked by a far-off cloud bank just above the horizon. 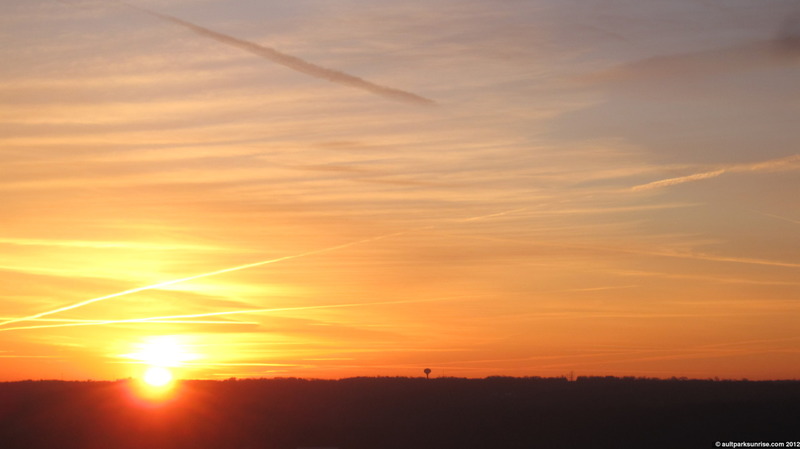 This morning we also have Guest Sunrise #5, with three repeat contributors. 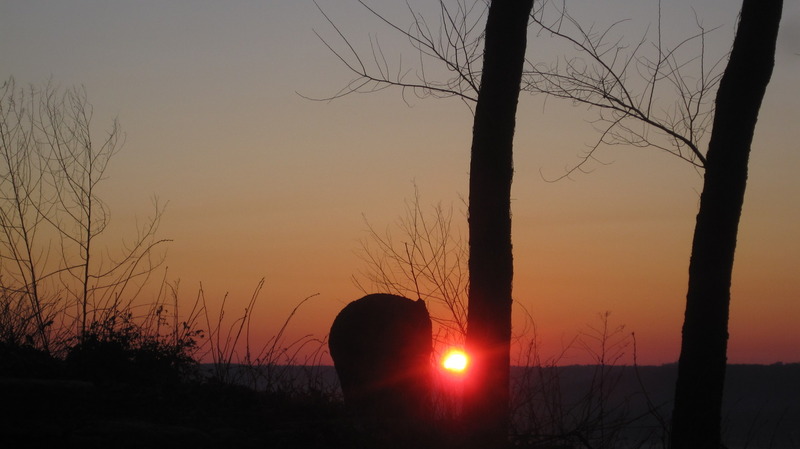 Tara shares one of her favorite sunrise pictures that was taken by her father in Exeter, Pennsylvania on November 13 1972. This is a special contribution and I am thankful that Tara chose to share it. The photo comes at us from just under four decades in the past. Thanks Tara! Two of my old roommates have also shared some of their recent sunrise shots. Both Phil and Trent have been commuting by bike, although it’s a bit easier for Trent out in San Francisco to be consistent than it is for Phil and I here in the midwest winter :). 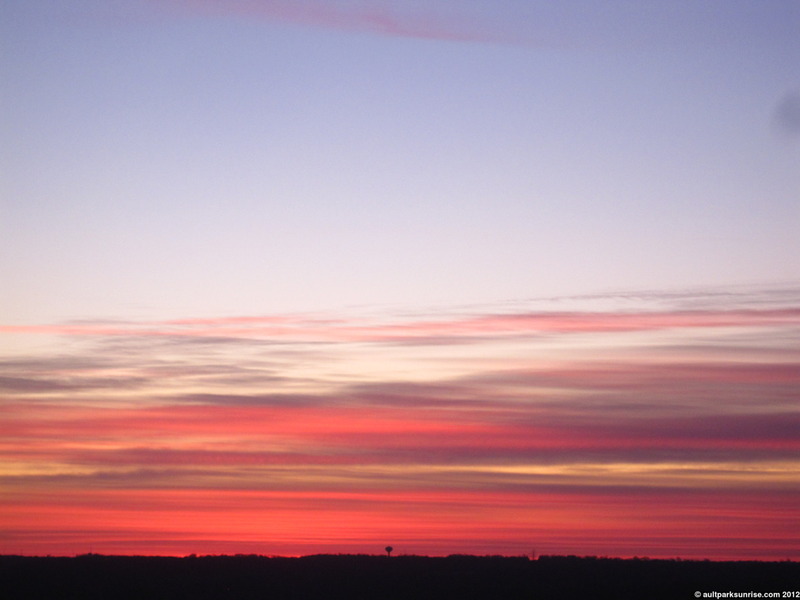 Phil’s sunrise is from sometime last week when the weather was breaking and we had a nice magenta display. I’m going to guess it may have been Sunrise 138. 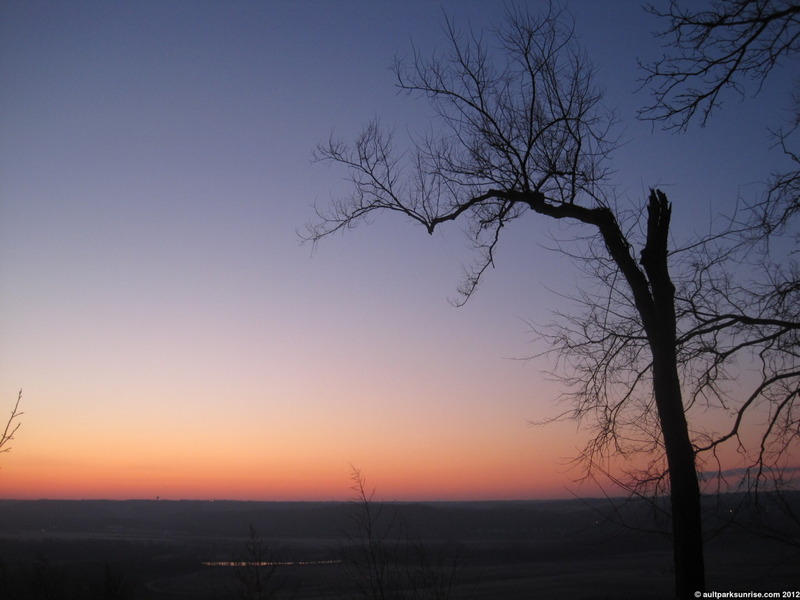 Trent has shared two sunrises, both from different days. Trent recently purchased a commuter bike for his new job out in the beautiful city of San Francisco, California. He has kept me up to date (and envious!) of his new morning commute through the parks and bike trails of one of the most bike commuter friendly cities in the US. 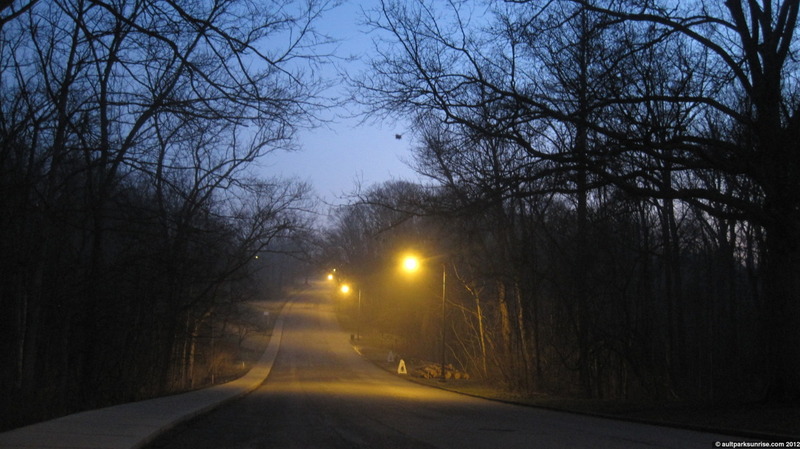 He mentions that as he leaves for work it is dark out, and by the time he arrives the sun is up. 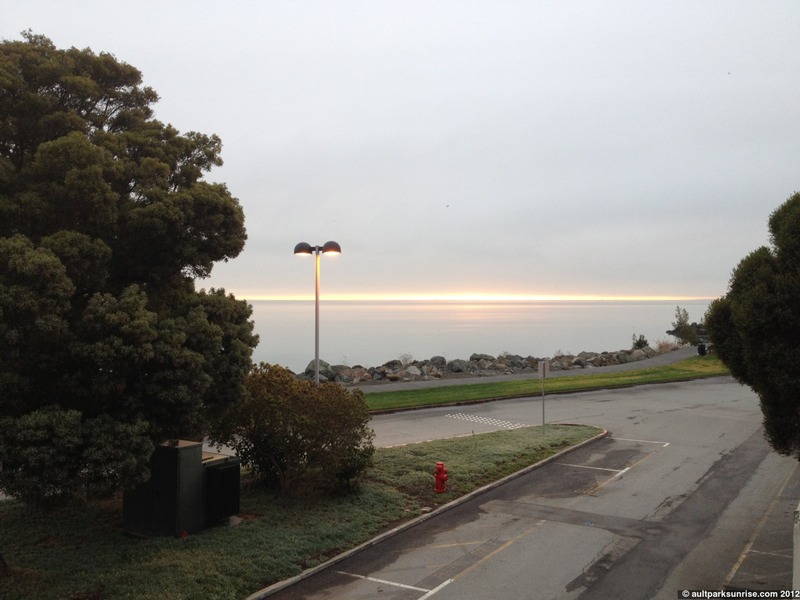 Recently it has worked out that the sun rises over the bay while he’s zipping through of the local parks. Thanks Phil & Trent for sharing! PS: I added a new link up there on top titled “Random“. If you click it you’ll be directed to a random sunrise post. Enjoy! In Trent’s own words “iPhone does not capture the majesty of these sunrises”. Thanks Trent! 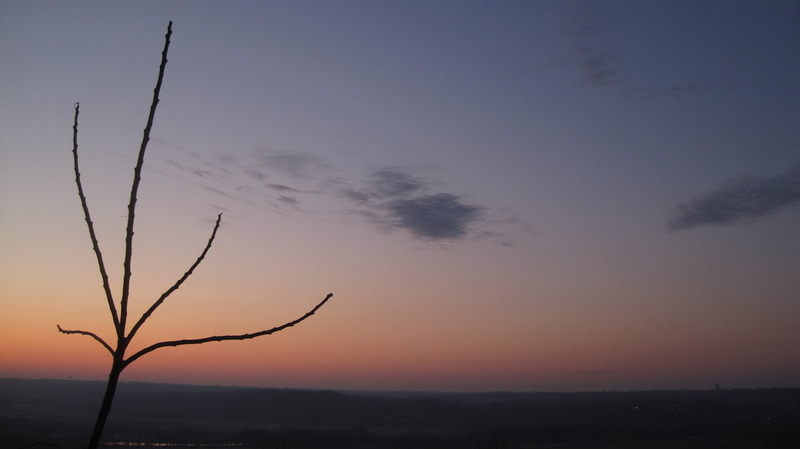 Onward to today’s sunrise over the Little Miami River Valley. The twilight sky was humid with lots of magenta this morning. 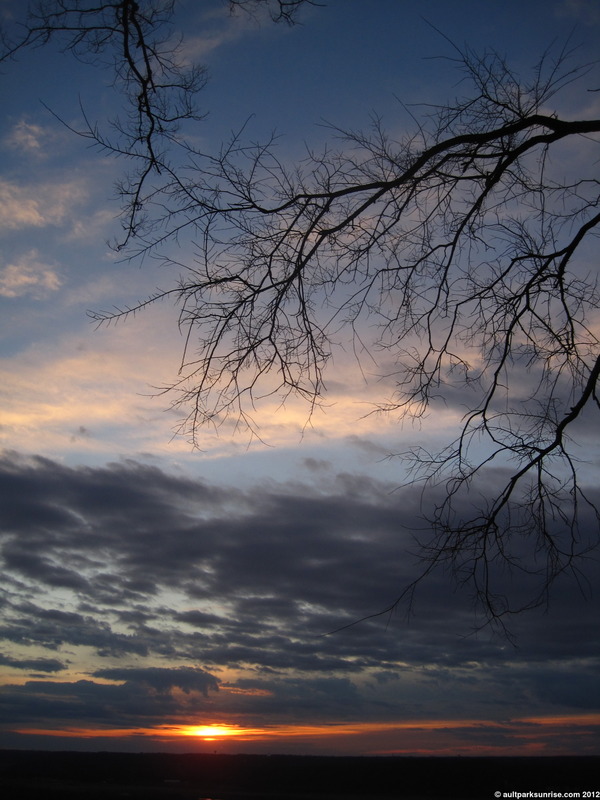 The whispy nature of the clouds added a smooth texture to the sky. The Little Miami River reflects some of the morning colors down in the old pre-glacial Ohio River Valley. 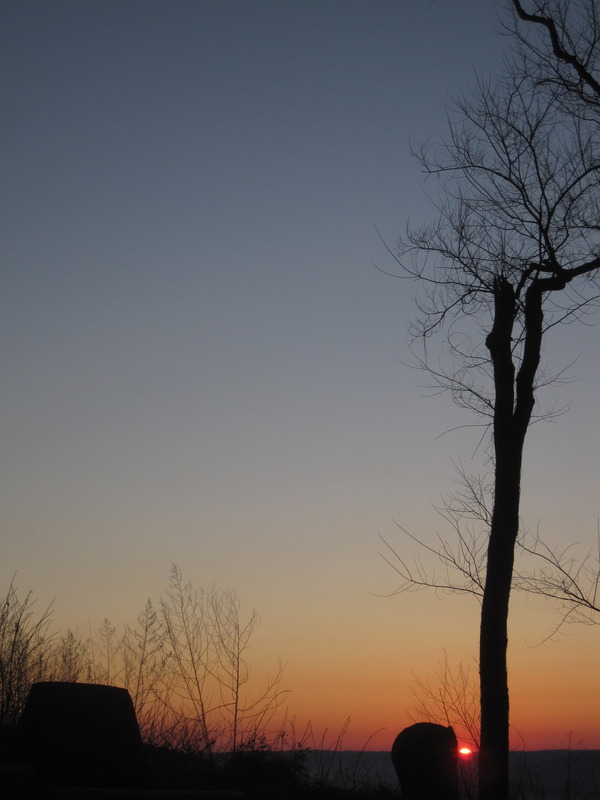 The Tree of Heaven silhouette against the late sunrise. Already the sun is beginning to slip back to the left, making me greatly appreciate that I have been able to get a hand full of pictures of this young tree over the past couple of weeks. 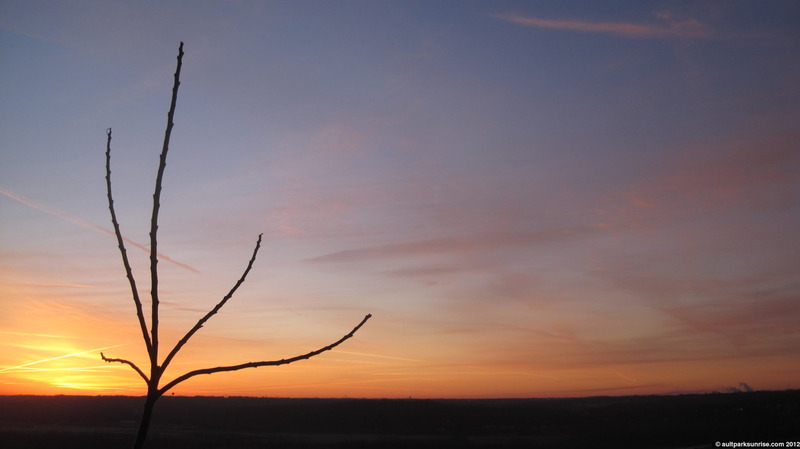 Tree of Heaven silhouette, this time with a view of the little miami river in the valley below. This morning’s sunrise fit my mood quite nicely. After the behemoth of a post that Sunrise 139 was, I was a bit drained this morning as I arrived to the overlook. It was also the first time in awhile I didn’t have any coffee, so I was happy about the subtle and calm yet still eventful sunrise. 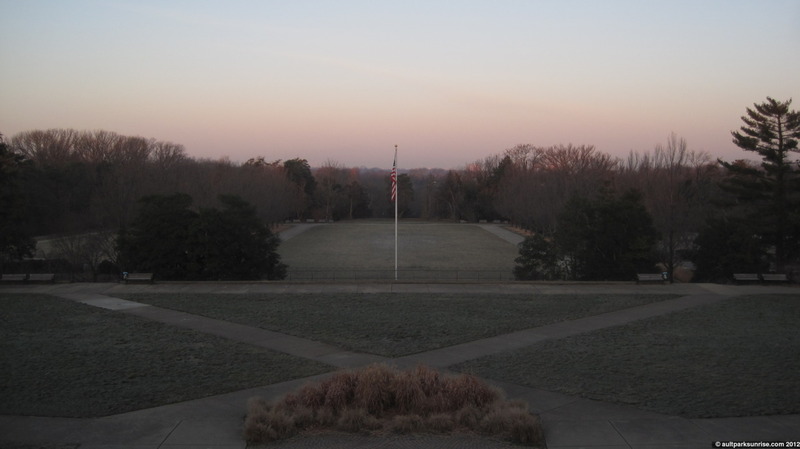 The temperature was pleasant this morning at a brisk 35F in the park. It appears we have a break today and then it’s back to the rain and freezing ice. The sunrise this morning was high humidity, which was marked with a nice blue atmosphere that had a touch of gray into late twilight, and a purple sun that slowly rose out of the cloud bank without caring much about announcing its arrival. The birds were active this morning, and with the wet and damp air it felt a bit like spring even though its months away. There was a friendly young man at the overlook this morning. We didn’t get to talk much, but his name was Derek. He makes an appearance in the final photo. As I came up the hill to the park, I was happy to see that I hadn’t missed the magenta creep. 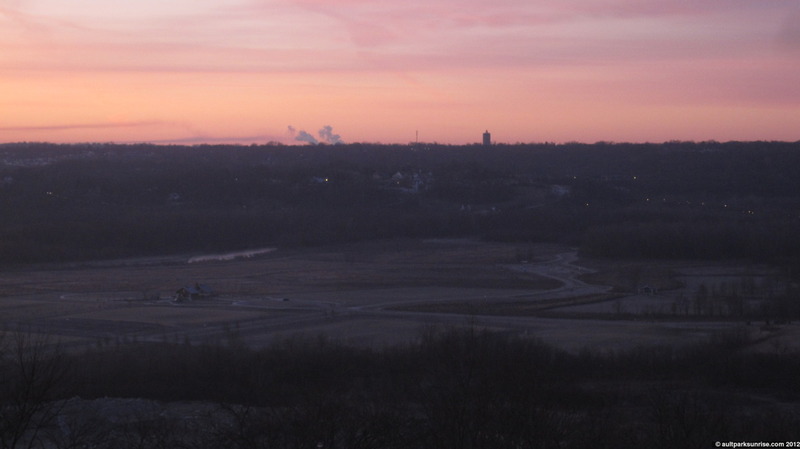 Here we see the atmosphere about 20 minutes before sunrise over the little miami river valley. 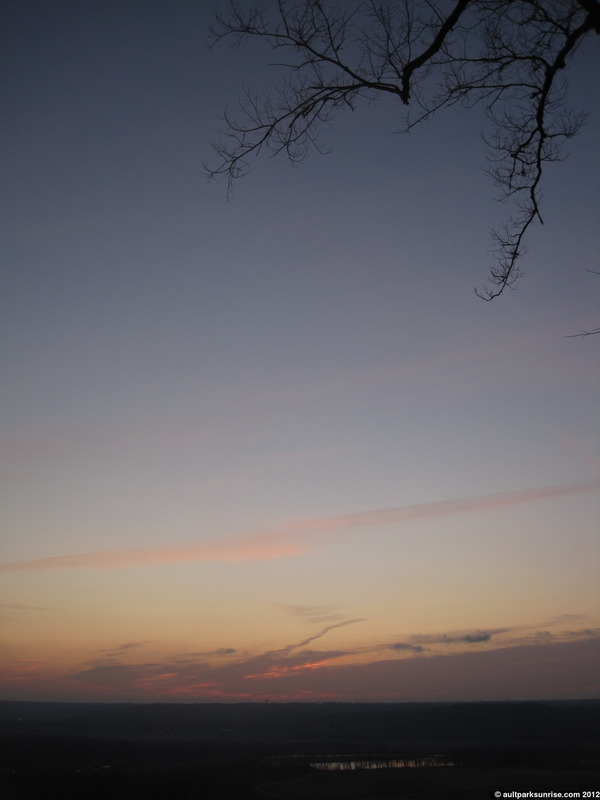 In a heavy humidity atmosphere, the sunrise colors can fade quickly. Lots of vapor trails this morning.